My daughter lovingly calls my father Poppy they have been inseparable since her birth 11 years ago , my fathers pretty incredible ,give ya the shirt off his back, drop everything to help in anyway and give ya his last dime if you needed it. Almost a year ago we had a scare, while hanging out at our house Dad suffered a mini-stroke. Doctors said it wasn’t as severe as other strokes but nevertheless it scared the hell out of all of us. It took him sometime to get back to the way he was before. Now doctors say hes as healthy as a horse ,so he has decided to take up the pipe once again after a thirty year hiatus. 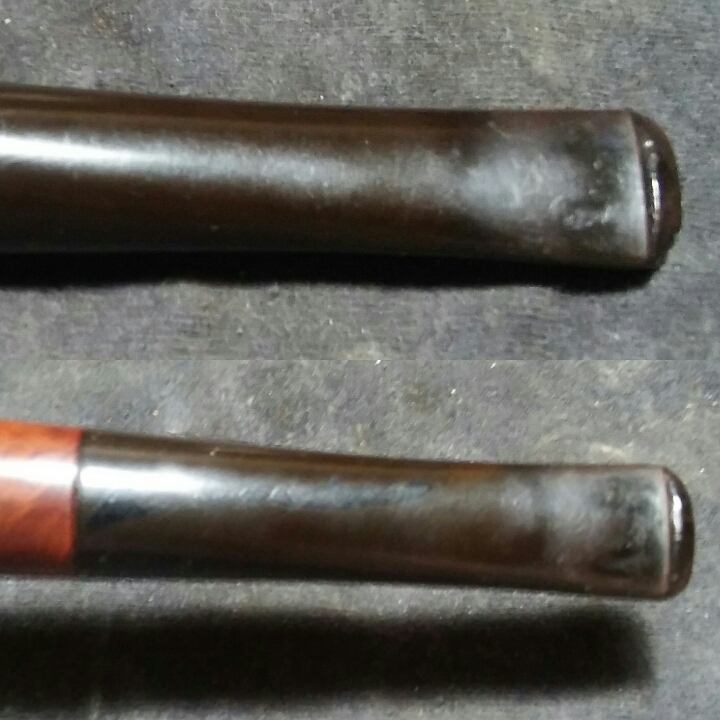 He picked a pipe from the wall to start with a bent Grabow with a spoon stinger , one of the first if not the first pipe I had redone years ago. I then told him I would like to redo a Custombilt that was similar to a Tom Howard he had liked. So that brings me to A Pipe For Poppy , a Wally Frank era Bilt Oom Paul. Shes been in the to do rack going on three years I would start but lose interest and put her back but now I had a reason to complete it. I gave him the pipe yesterday and his eyes lit up, needless to say he was very happy with finished pipe. 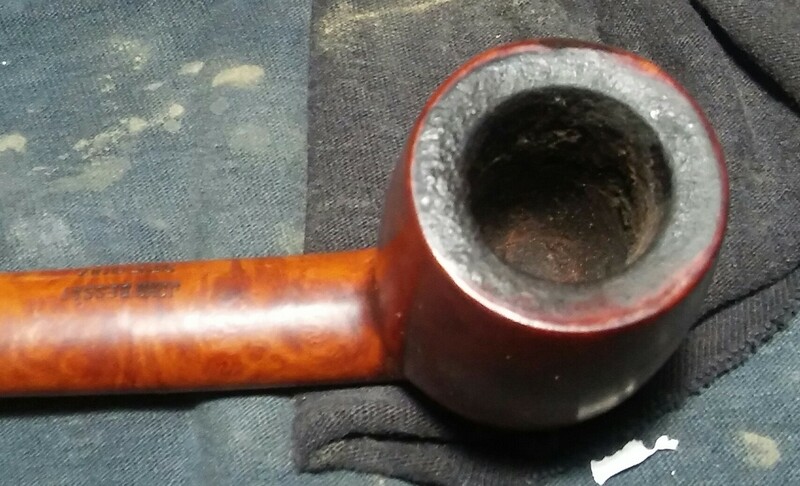 The pipe had been started and stopped a few times since I received it, so the reaming and internal cleaning had already been done previously. 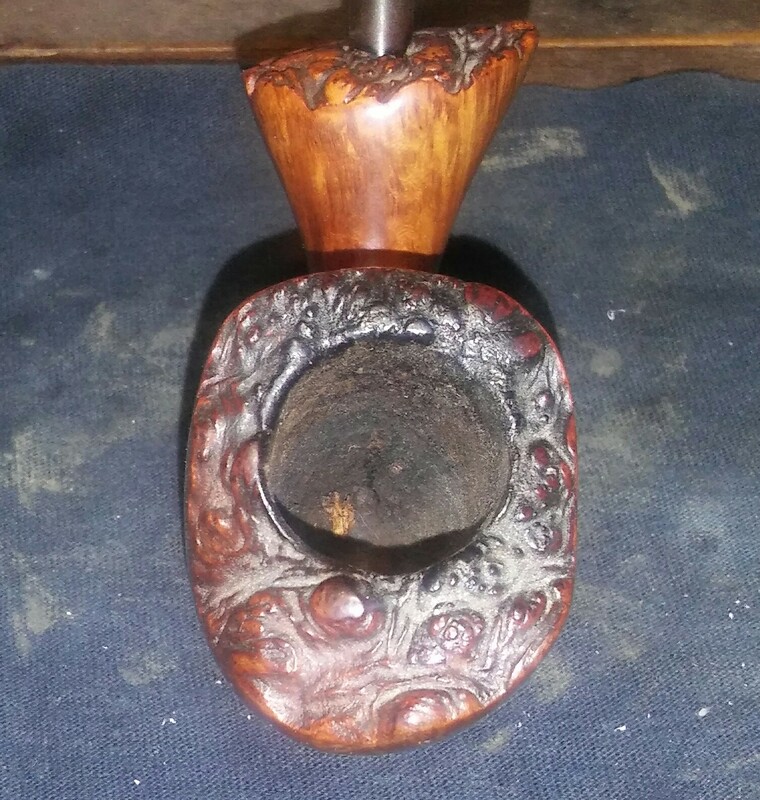 The chamber was free of pitting, there were a few tooth impressions and oxidation on the stem.The previous owner had carved a P into the bottom of the stummel. The pipe is for my farther and my daughter calls him poppy so the P is fitting but too tacky for my taste. My attention was drawn first to the P caved in the bottom of the stummel, luckily it wasn’t to deep. Starting with 220 grit sandpaper I removed the bulk of the self carving, then moving to 400, 800 and finished with 1000 grit sandpaper. 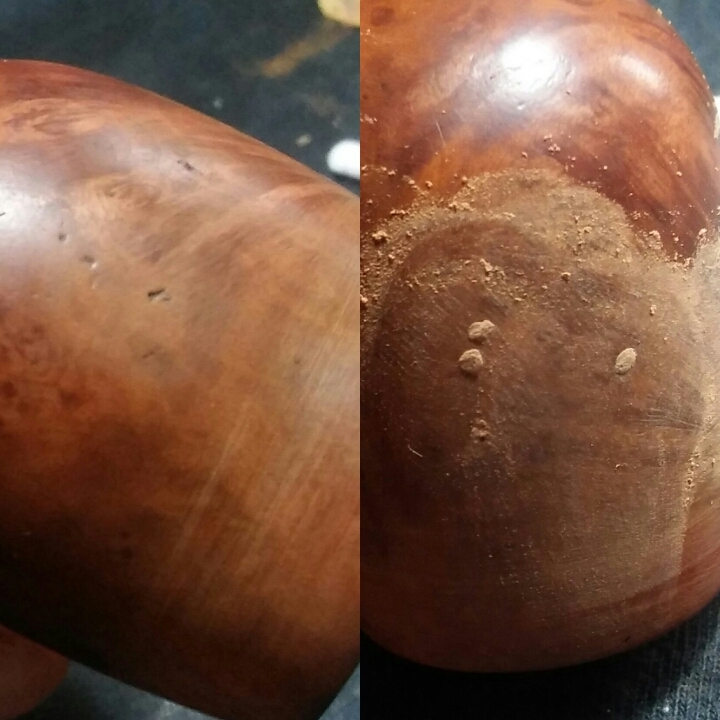 I lightly sanded the stummel with 800 grit sandpaper then gave the stummel a wipe down with an EverClear soaked rag to remove the fine sanding dust. Before hitting the buffer I applied a coat of Howard’s Butcher Block Conditioner , I applied using a Q-Tip then leaving it aside to penetrate, removing the excess with a clean rag. I applied a generous amount of non-bleach Soft Scrub to the stem and left it aside for the Soft Scrub to soften the oxidation. 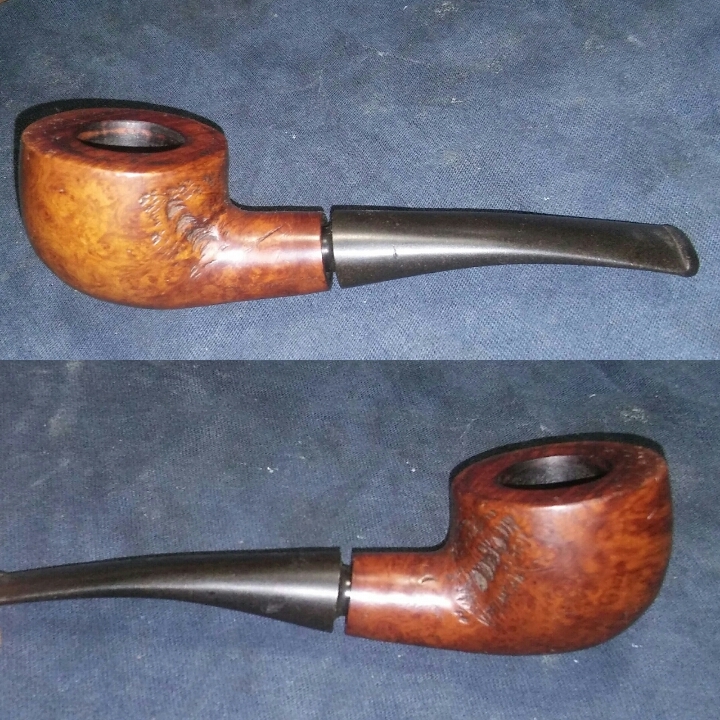 Once the Soft Scrub turns from white to brownish color its time to scrub vigorously adding more Soft Scrub as needed until all oxidation has been removed, holding the stem under natural light will help to see if all oxidation has been removed. 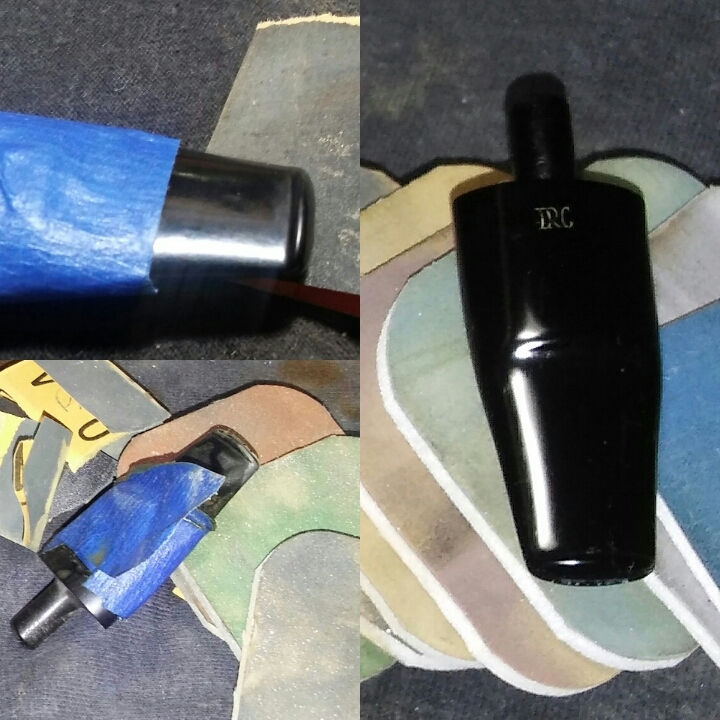 With the oxidation removed I focused on the tooth impressions , the rest of the stem was in good shape so I taped off the bit/lip area of work with blue painters tape so my sanding would remain in this area. I removed the deeper impressions with a flat sided needle file. I removed the rough file marks with 400,800 and 1000 sandpaper wet. I now ran the stem though the various grits of micro-mesh 1500-2500 wet and 3200-12000 dry ,polishing to a shine. I finished up on the wheel with white diamond , carnauba and a micro-fiber hand buffing. Buffing the stem with blue compound and carnauba. I’m looking forward to the first smoke. My free hand pipes can be counted on one hand , I’m not the biggest fan but once and a while one catches my eye .Erik Nording, Preben Holm, Ben Wade, Karl Erik Ottendahl and W.O. 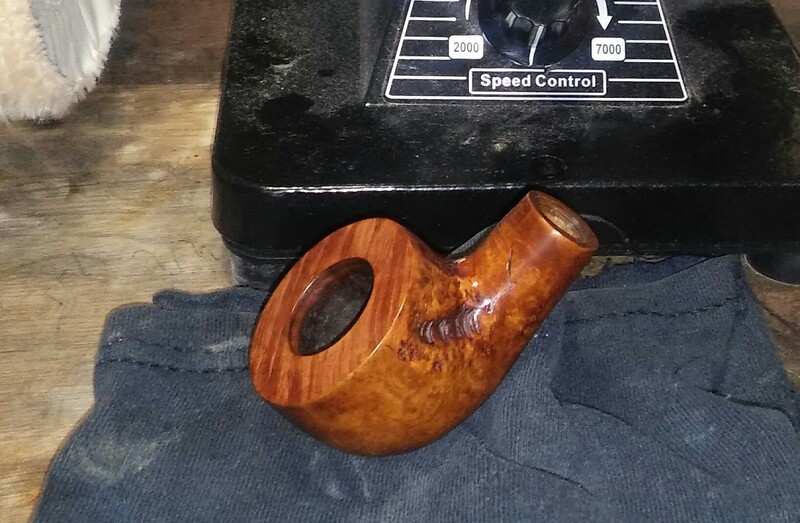 Larsen pipes are a few I keep an eye out for but they have to be the right shape and preferably smooth , so as luck would have it I found just that a Karl Erik and at a price I couldn’t refuse thirteen bucks. Now for thirteen bucks your not getting mint condition , some work would be involved . The stamping reads Karl Erik over Hand Cut In Denmark and below that the number 5. I’ve read the grading of his pipes but was unable to find the use of the number 5. 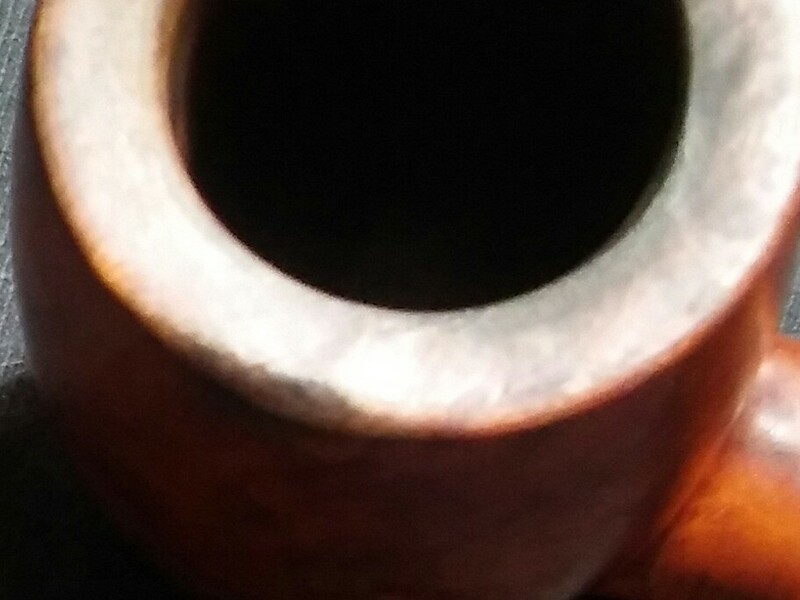 To my eye the pipe is flawless not an ounce of filler. 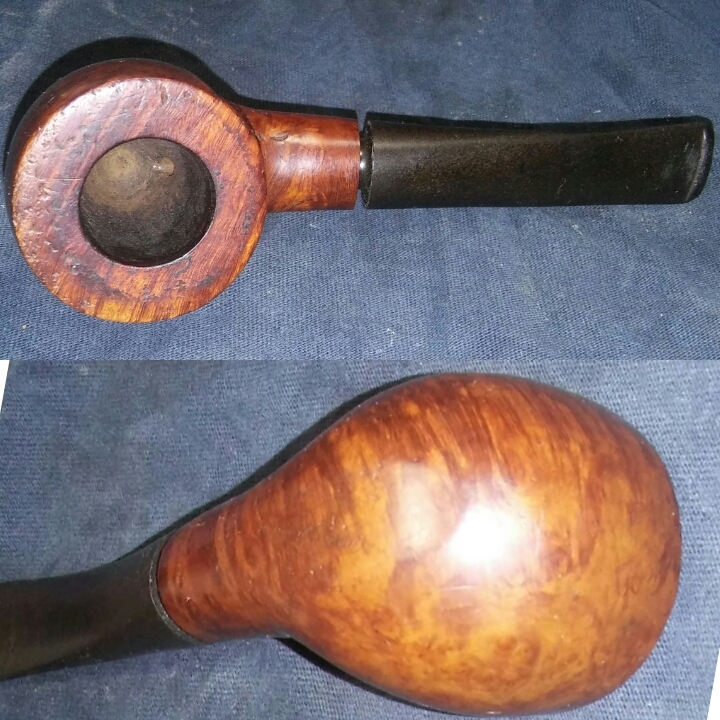 The stem on the other hand may not be original to the pipe there are no markings of any kind but I have also seen a few examples considered original without the KE stamped on the stem . The cracked stummal was the biggest issue , I couldn’t tell from the auction photos how deep or how far the crack had run. 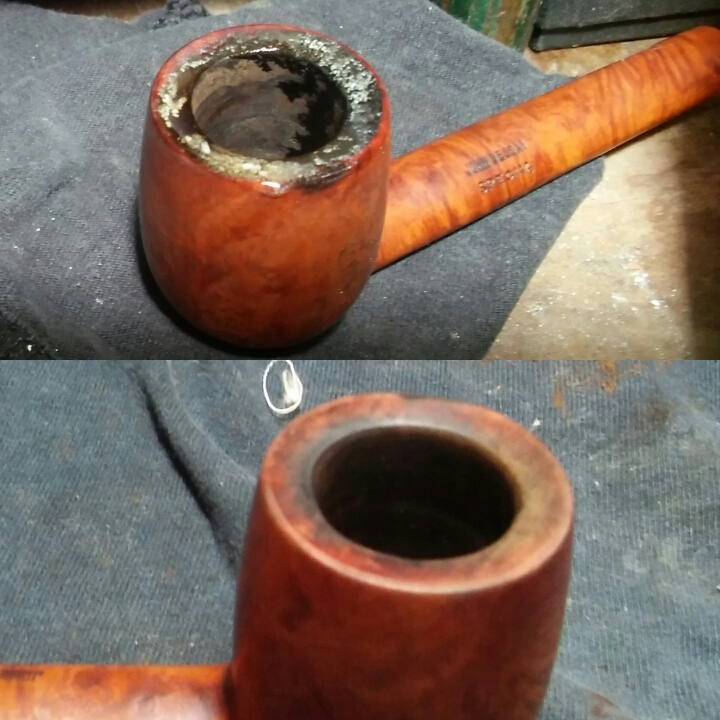 Once the pipe itself was in my hands I was happy to see it was a stress crack and not due to a drop. As the briar dried it twisted and formed the crack. The stem was worn , oxidized and the lip was nonexistent. 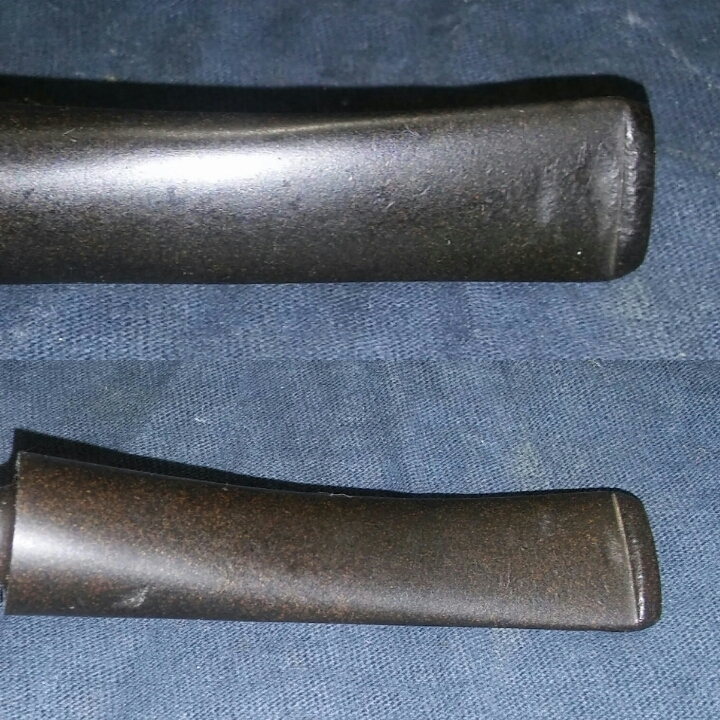 The rest of the pipe was in decent shape. 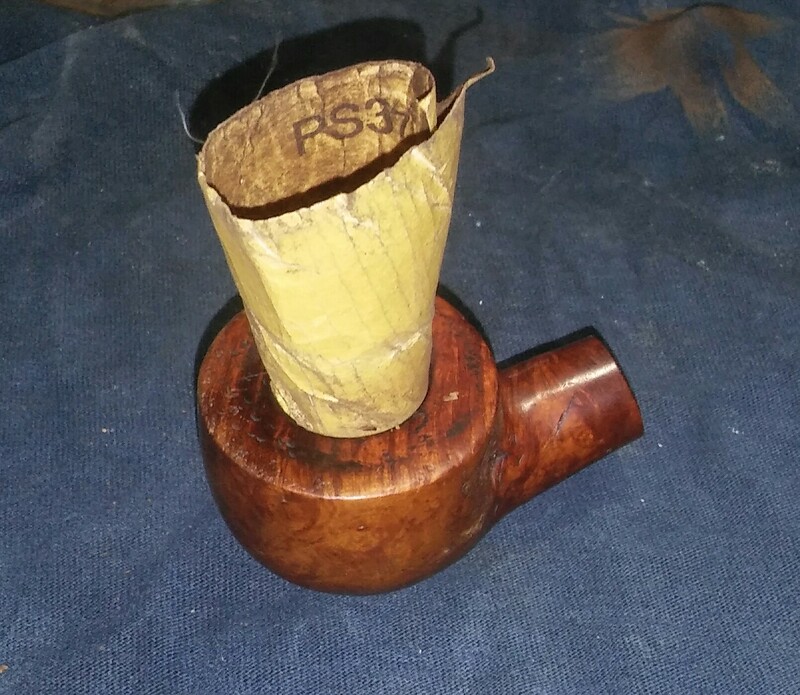 A few years ago my wife had picked up a couple of stem blanks on clearance from Pipe Smokers Emporium , I decided to re-stem the pipe and save the original stem to work on later. Using the Pimo tenon turning tool I cut down the tenon until it almost fit the mortise finishing with 400 grit sandpaper to get the snug fit required . I now taped off the tenon with painters tape and tightened the tenon in my mounted drills chuck. I set the drill to auto run and began to shape the stem with wood carving chisels. I cleaned up the rough edges with a needle file and rounded some of the sharp corners with 1000 grit sandpaper. 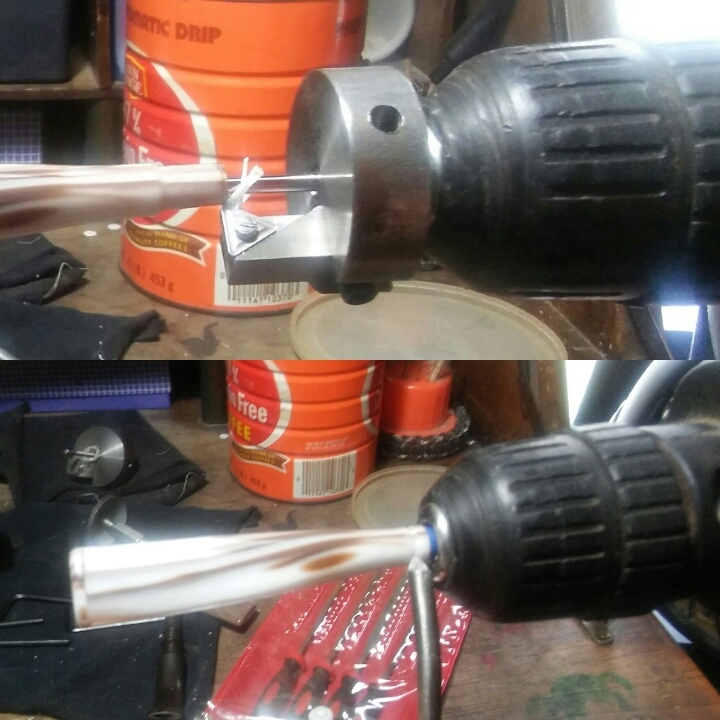 Using a sanding drum mounted in my drill I began to shape the stem , once I had the basic shape I was looking for I sanded the stem with 150, 220, 400 and 800 grit sandpaper. Before the final sanding and polishing I put a bend in the stem using my Wagner heat gun and bending it over a pill bottle. With the bend in the stem I could now run the stem through the various grits of micro-mesh 1500-2400 wet and 3200-12000 dry. With the stem complete I could now focus on the stummel, Using my PipNet reamer starting from smallest to largest I reamed back the cake to a suitable thickness. I now cleaned the internals using EverClear , shank brushes , Q-Tips and stiff/soft pipe cleaners , cleaning until my final pipe cleaner came out as it went in. Now to address the cracked stummel, I cleaned the area with an EverClear dipped Q-Tip and removed the embedded debris with a X-Acto knife. Using a jewelers loop I looked carefully for each end of the crack. One end started just at the top of the shank and the other end of the crack ended at the bottom front of the stummel. Using a 1/16 drill bit I drilled a shallow hole at each end of the crack, to prevent it from cracking any further. I then filled the crack and holes I drilled with Gorilla Glue and briar dust. 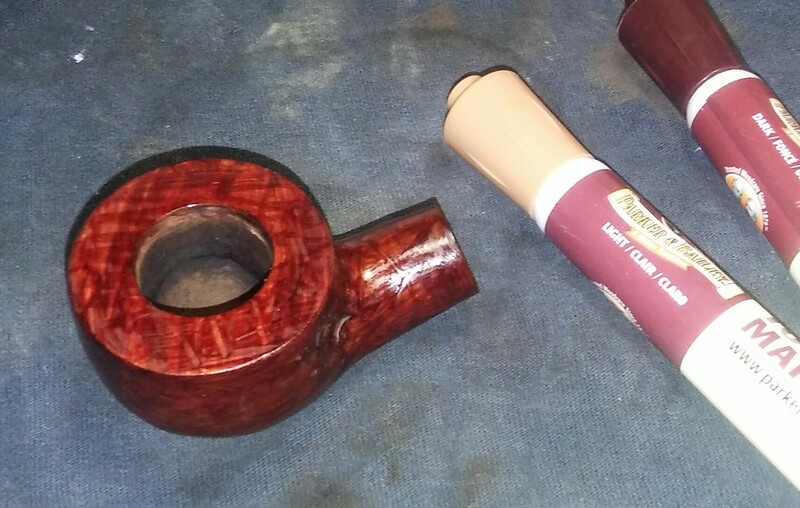 I sanded the area of repair first with 220 grit sandpaper, it seems I should start with a less abrasive grit but the crack was raised at one side due to the twisting as the briar dried. Once the cracked area was sanded flush with 220 grit sandpaper I moved to 400, 800 and finally 1000. 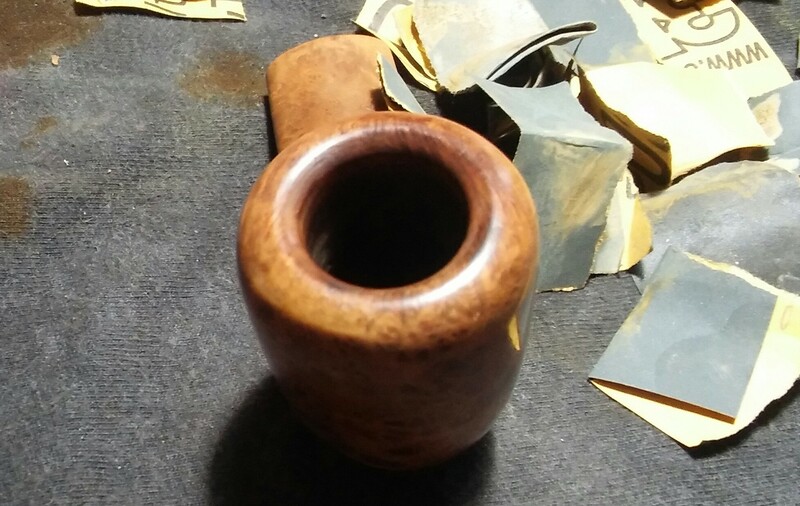 At this time I lightly sanded the entire stummel with 1000 grit sandpaper then wiping down the stummel with an EverClear dampened rag to remove the fine sanding dust. I now mixed dark brown Fiebings leather dye with EverClear to lighten it a bit. 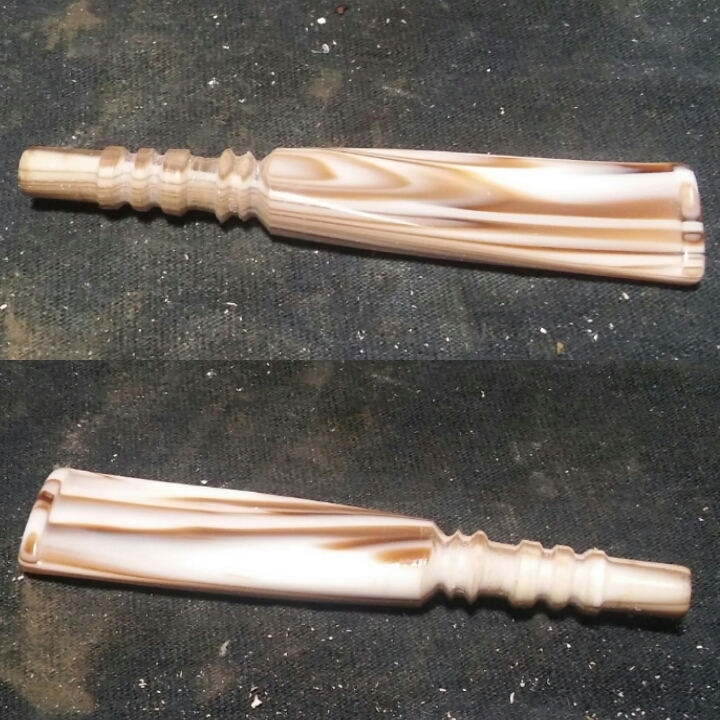 I coated the stummel with a few coats of the dye hitting it with a Bic lighter to set the stain. The stummel was substantially darker then it was when originally received but in order to hide the repair it would in turn need to be darker. I removed the excess stain with an EverClear dampened rag. I finished up on the wheel with white diamond , carnauba and a micro-fiber hand buff. Buffing the stem with carnauba. An almost completely smooth Custom-Bilt an oddity I’ve wanted for my collection for some time . 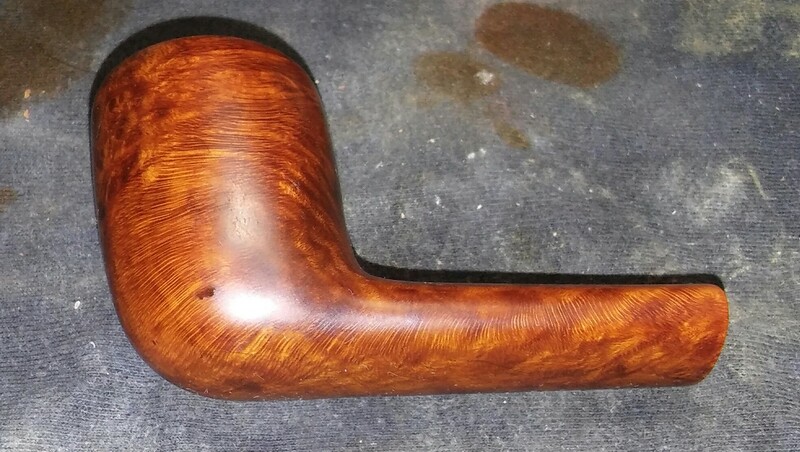 I have read of completely smooth Bilts (which I have yet to see or find) and partially rusticated Custom-Bilts, I’ve seen a few photos of the partially rusticated pipes but never had the chance to get my hands on one. So when this puppy popped up a few weeks ago on EBay at a reasonable price I jumped all over it. 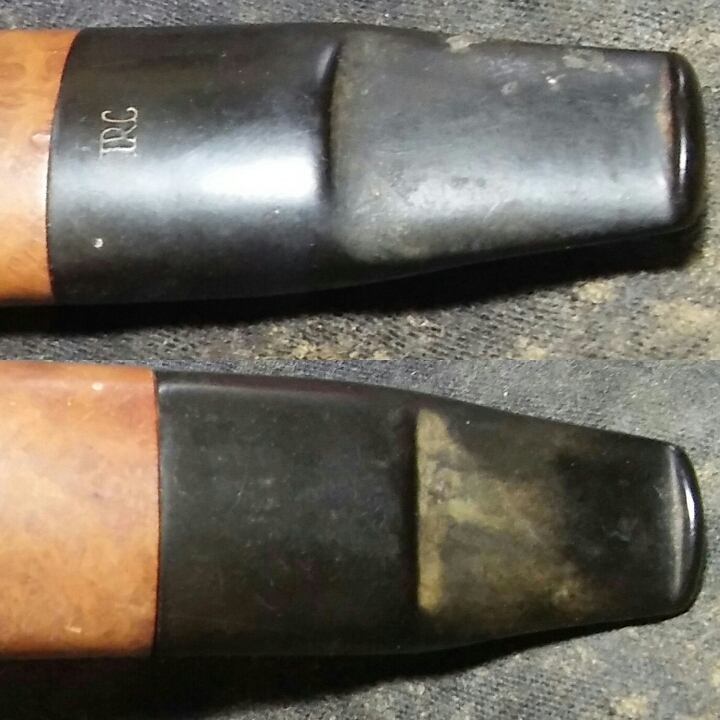 Now I won’t go into the history of Tracy Mincer and Custom-Bilt pipes as I have written a few posts on the subject in the past but I must say I’m more and more impressed with each one I receive. 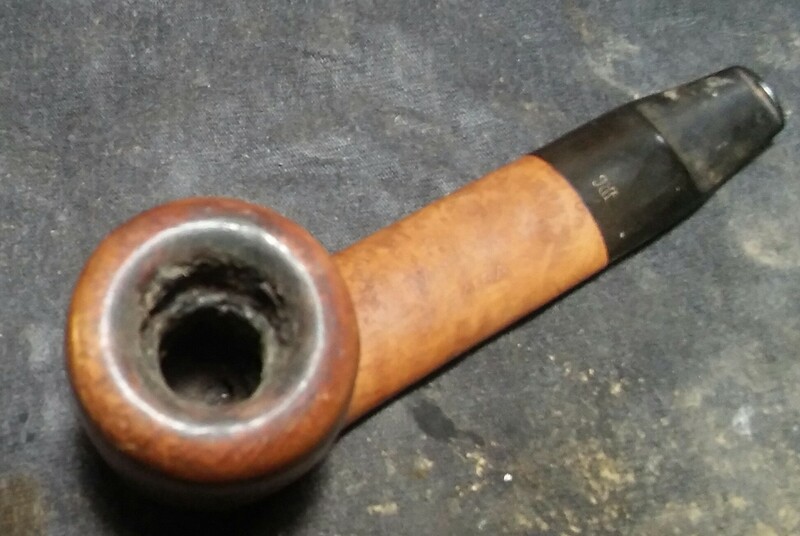 The pipe for its age was in pretty good shape, ether it was well taken care of or it has seen little use. The chamber was free of cake and the mortise was fairly clean, the rim was the only issue a little beat up. The stem was oxidized , had a few tooth impressions and a ding in the side of the stem. The chamber being as clean as it was, it would not need a reaming but just a quick sanding with 400 grit sandpaper to remove a little doddle . I attempted to steam out the dents in the rim using a household iron and damp rag but the indentations were to deep. The rim would need to be topped , I tape a sheet of 400 grit sandpaper to my work surface and began sanding the rim until smooth . I then sanded with 800 and 1000 grit sandpaper until I had a mirror finish. 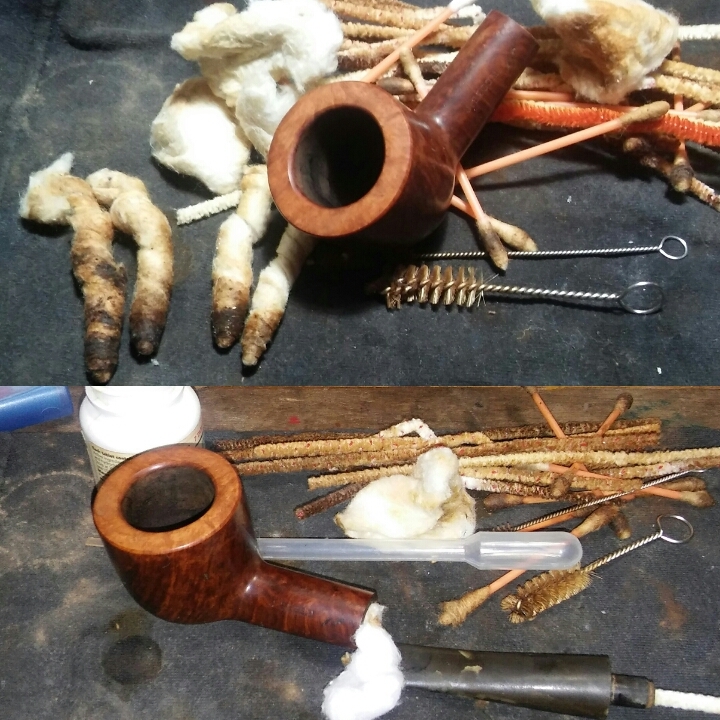 I gave the stummel and stem internals a good cleaning using EverClear , shank and mortise brushes , Q-tips , cotton balls and soft/stiff pipe cleaners. I un-roll cotton balls and form a swab then twist it tightly into the mortise , then fill the chamber with a little EverClear and allow the swab to absorb the alcohol. I leave it to sit for for a few minutes to brake up the old tars and oils in the mortise. Using furniture touch-up markers I re-stained the stummel and freshly topped rim , leaving it aside to dry. I removed the excess stain with an alcohol dampened rag. 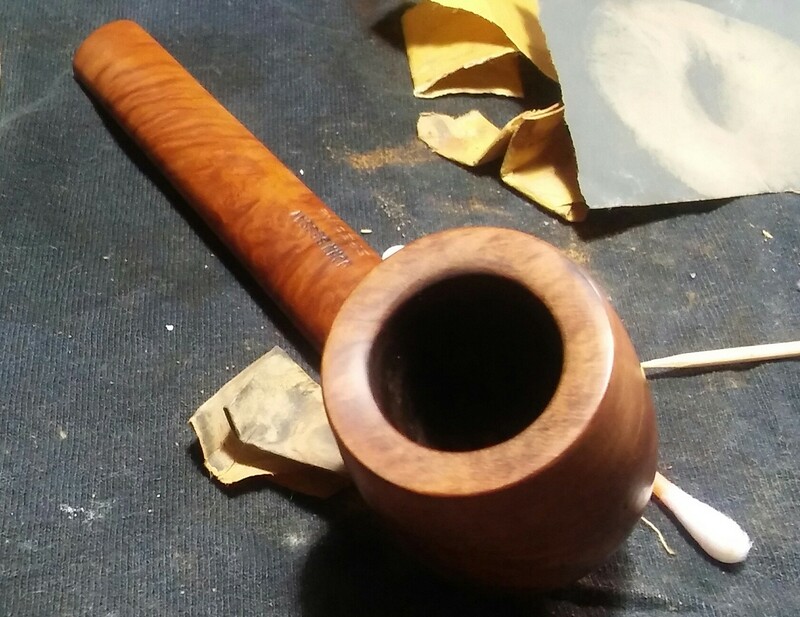 Usually I wait till the end to buff the stummel and stem but this one I couldn’t wait to see finished . 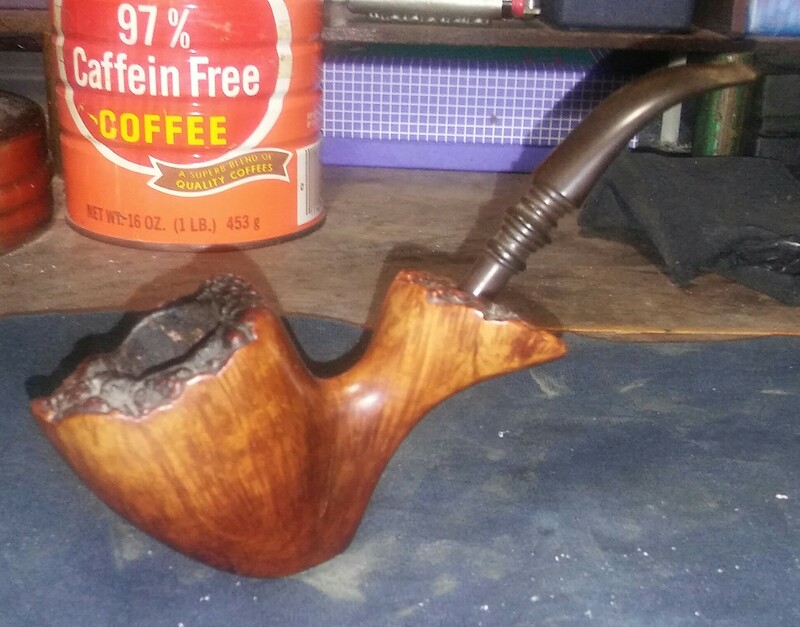 There are imperfections in the briar , a few pits and places that could have been filled but I decided it gave this particular pipe character. The stem oxidation was the next task, I appalled a generous amount of non-bleach Soft Scrub to the stem and left it aside to penetrate the oxidation . Once the Soft Scrub turns from white to a brownish color its time to scrub vigorously with a rag, adding more Soft Scrub as needed. Holding the stem under natural light will help to see if all oxidation was removed. 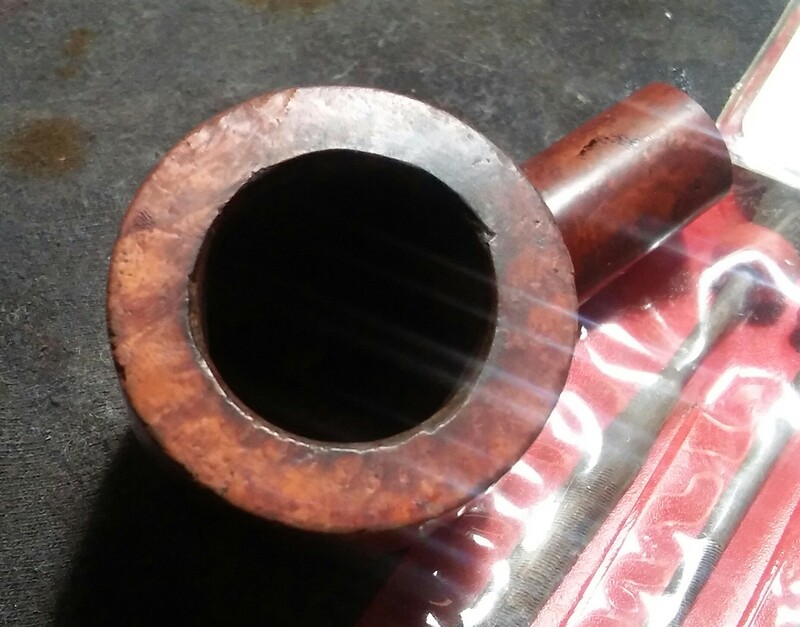 When I received the pipe the stem and shank fit were off , the briar inside of the mortise was pushed up by the tenon and forming a wall that the tenon could not pass in-turn leaving a gap. Using a half round needle file I removed the excess briar , the fit was better but not flush , I then filed down the tenon edge and rounded it off with 400 grit sandpaper to get the proper fit. I tried to raise some of the tooth impressions with heat to no avail. 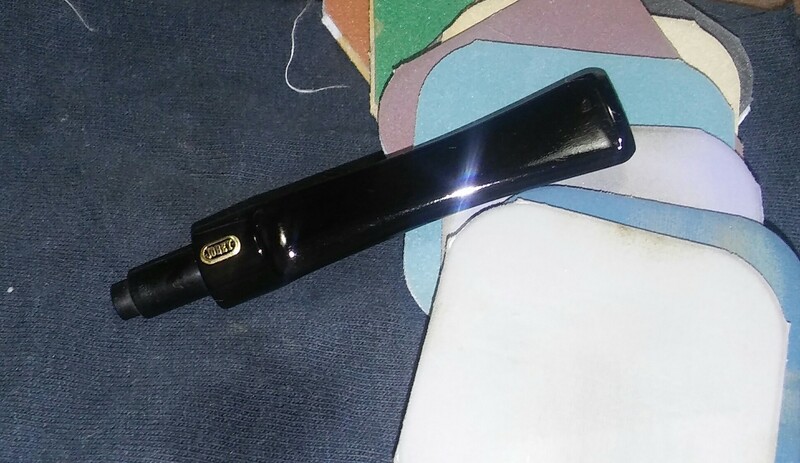 I mixed thick black CA glue and charcoal powder into a paste and applied it to the stem with a toothpick , hitting it with accelerator to set the glue , leaving it overnight to cure. The next morning after allowing time for the patch to cure I removed the excess glue with a flat needle file. 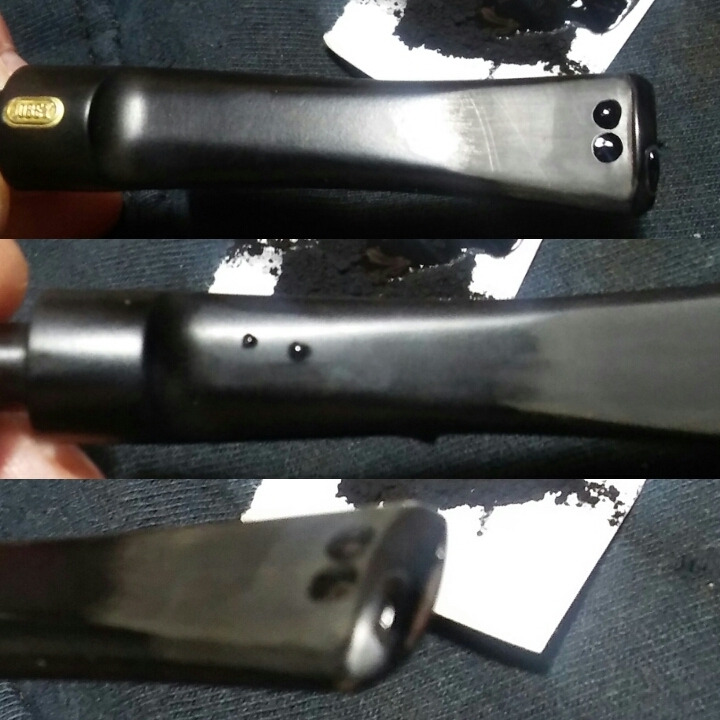 I removed the file marks with sandpaper starting with 400 grit and ending with 1500 grit sandpaper. I started saving the windows out of selling packages for my stem/shank divider , like the kind in kids toy packaging. Its flexible and seems like I can get a little closer to the end of the stem , closer then I would with a washer. I now ran the stem though the various micro-mesh pads. I finished up with white diamond , a few coats of carnauba and a micro fiber hand buff. Buffing the stem with blue compound and carnauba. This is second out of the lot of eleven I picked up sometime back. Jobey Pipes they’ve been around for a long time and changed hands a time or two for more info Pipedia they have the history in a click. 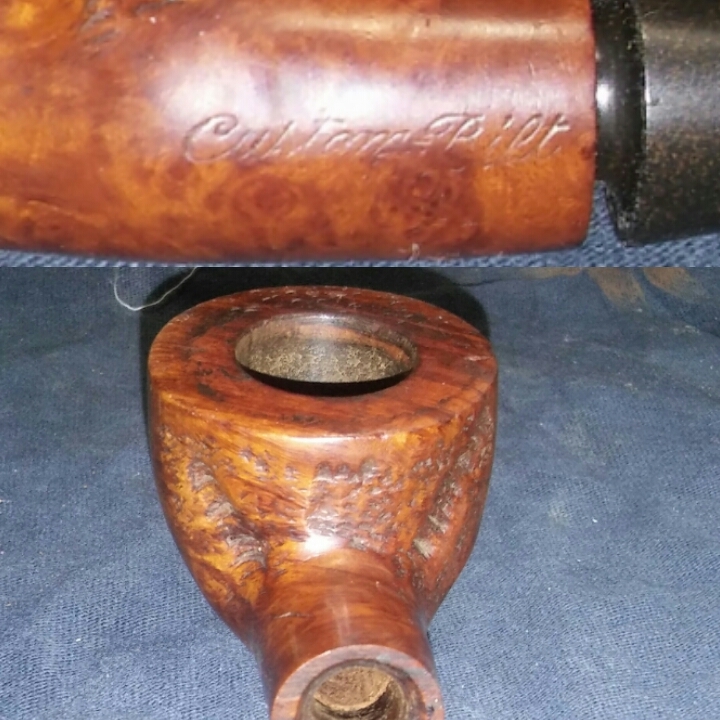 I couldn’t lock down a precise year for this one but nevertheless shes a beaut, large chambered pot for along smoke, something I look for in a pipe . 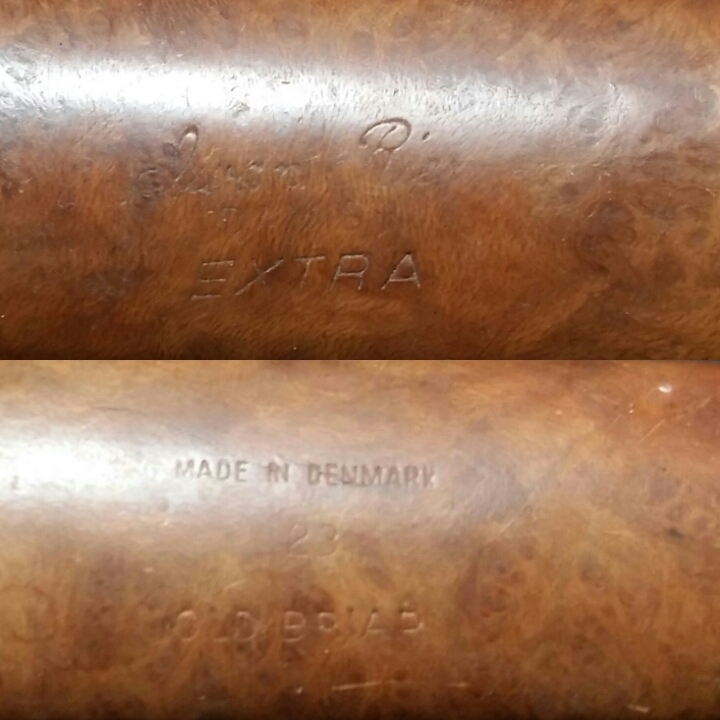 The pipe itself is stamped on the underside Jobey Shellmoor, Extra, Imported Briar and English Para on the stem. Upon inspection she was a solid pipe nothing too troubling, rim tar, thin cake, stem chatter, impressions, oxidation and this funky inner tube that looked as if someone tried to chew it off. The toughest part would be the inner tube it was glued or epoxied in place. Starting with my Pipnet reamer and the smallest attachment I began reaming back the old cake, working my way up to the largest attachment. The chamber was so large that the final attachment could not reach the inner walls, I finished up with 400 grit sandpaper to complete the chamber. 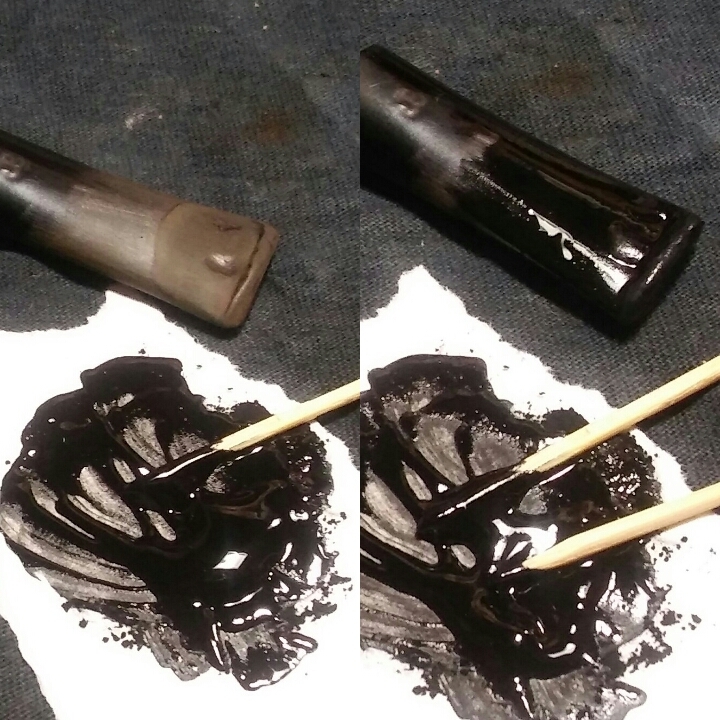 Next I applied a generous amount of Method Wood For Good polish to the rim and left it upside down on a make-up pad and allowed the polish to penetrate the build-up. Once the polish softened the build-up it was removed with a children’s toothbrush and Q-Tips.At this time I gave the stummel a wipe down with Method polish, a rag and a children’s toothbrush to remove any debris in-bedded in the crags. 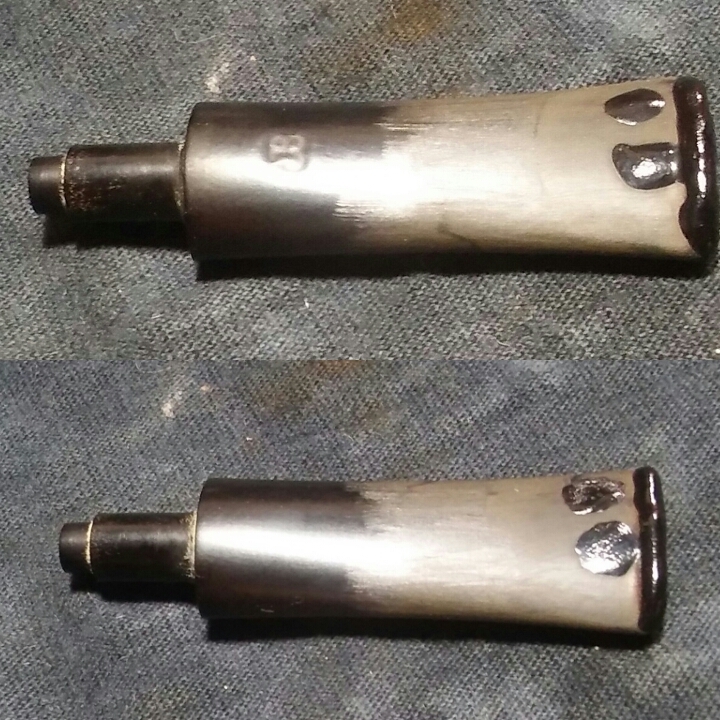 I cut off the end of the mangled inner tube with snips and using a 1/8 inch bit tightened in my drills chuck I hand turned the stem until all of the aluminium tube was removed. 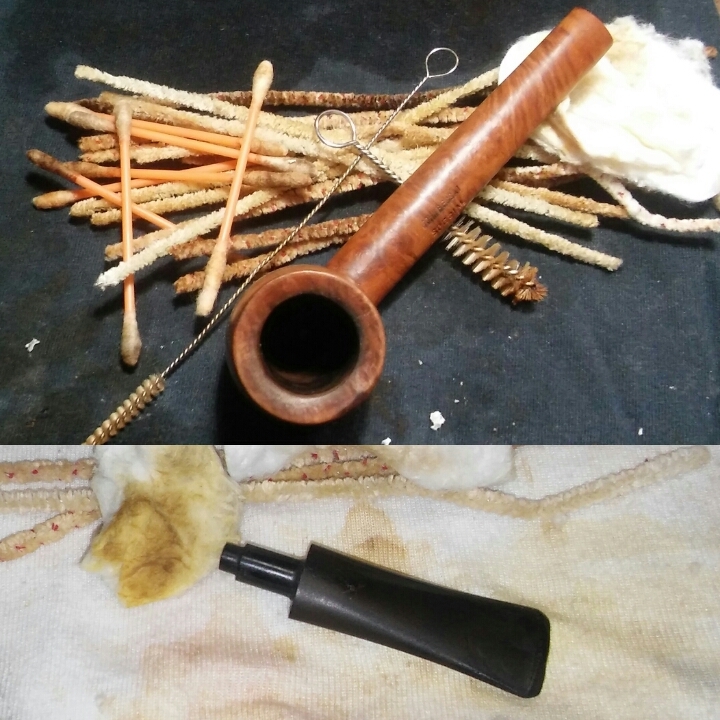 I gave the internals of the stummel and stem a good cleaning with EverClear, shank/mortise brushes, Q-Tips and stiff/soft pipe cleaners. Cleaning until the final pipe cleaner came out as it went in. Next I removed the oxidation from the stem using non-bleach Soft Scrub, I applied the Soft Scrub to the stem and left it aside so the Soft Scrub could penetrate the oxidation. Once the the Soft Scrub turns from white to a brownish color its time to scrub vigorously with a rag until the oxidation is removed, applying more Soft Scrub as needed, holding the stem under natural light will help to see if all oxidation was removed. The tooth impressions would need filling, I sanded the area of the indentations with 400 grit sandpaper and cleaned with an EverClear dampened rag to remove any sanding dust before filling. I mixed thick black CA glue and charcoal powder together to form a paste, then applying it to the impressions with a toothpick, hitting it with accelerator to set the patch. I left it overnight to cure. After allowing time to cure I removed the excess with needle files and sandpaper. Before hitting the wheel I ran the stem though the various grits of micro-mesh pads. I finished her up on the wheel with white diamond, a few coats of carnauba and micro-fiber hand buffing. Buffing the stem with blue compound and carnauba. Way back in February Clint of Pipes Scoundrels sent a huge package out of the blue . We had spoken a month or so before of a pipe that was in need of care but never figured out a plan. In the package a letter where he offered up a trade of sorts skill for skill, I love the barter system. In the package an incredible framed Pen & Ink work, that I watched though his blog come together. I was blown away by his skill and photos online. I had no idea it was coming my way, in person it was even more amazing, beautifully done. Also in the package a couple of Pipe Scoundrels stickers ( he has a killer logo) and three pipes in need of repair/cleaning. A couple John Bessai pipes one Canadian, one Pot and an Iwan Ries a unique shape I wasn’t familiar with. 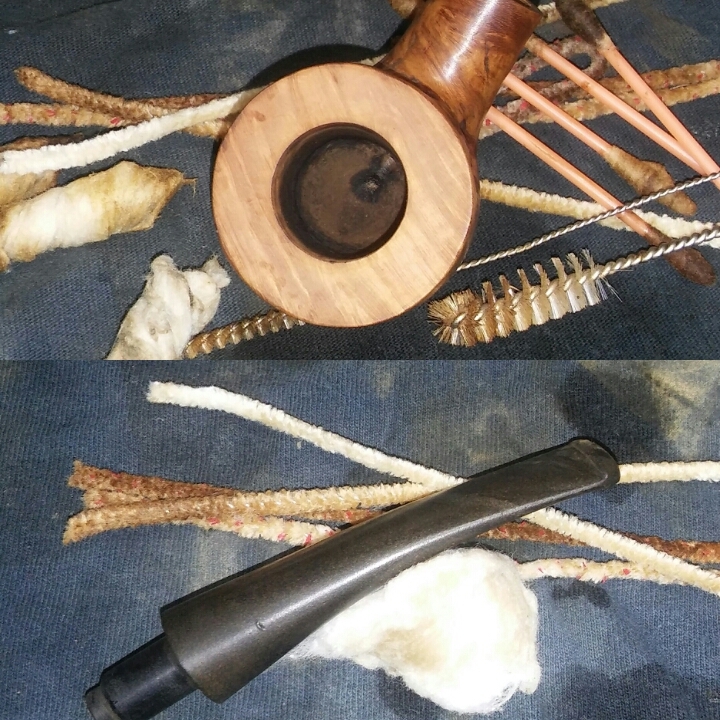 I was excited to get to work , this was the first time I was to work on someone else’s pipes but I got side tracked and side tracked again but finally I had some time to sit and finish, now the three are complete. The Canadian was in nice shape, to be honest I was saving the best for last and what I thought would the easiest but I’ve been wrong before. 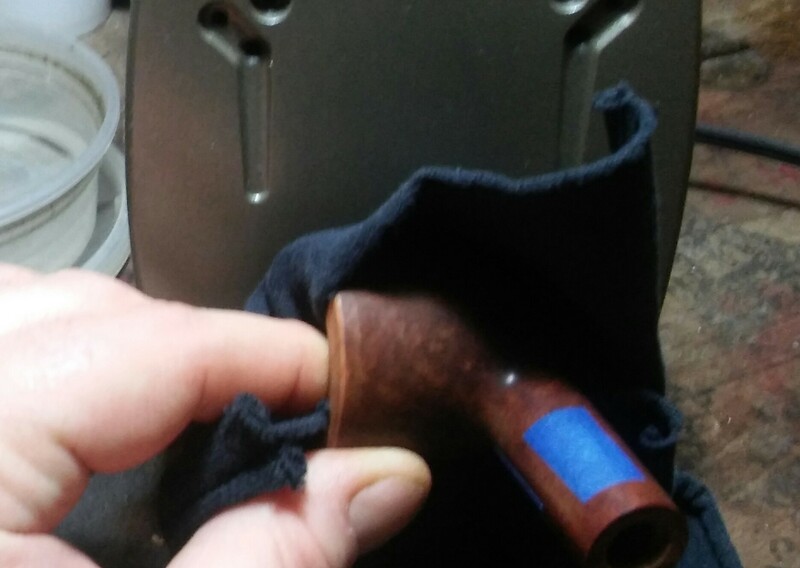 Aside from the deep tooth impressions and a small burn on the side of the rim, the pipe was pretty clean. Light build up on the rim and two spots that would need filling. Starting with the chamber and my PipNet reamer I took the cake back to a suitable thickness. The like the rest of the pipe the chamber looked good. I applied a generous amount of Method Good For Wood Polish to the rim and left it to penetrate the build up. Once the build up softened it was easily removed with a Q-Tip and make-up pads. I now concentrated on the internals of the stummel and stem. Using EverClear, Make-up pads, Q-Tips, shank brushes and stiff/soft pipe cleaners, cleaning until the last pipe cleaner came out as it went in. The side of the rim had a small burn, topping was not an option. I didn’t want to change the shape of the bowl. Using 800 grit sandpaper I worked at the burnt area until it faded , it wasn’t perfect but better then loosing the shape. There were three pits on the front of the stummel, ether they were never filled or the fill crumbled away over the years. I cleaned the area with a Q-Tip dipped in EverClear and filled the pits with Gorilla Glue and Briar dust. Once the fill dried I the sanded the filled areas flush with 800 grit sandpaper finishing with 1000 grit sandpaper. 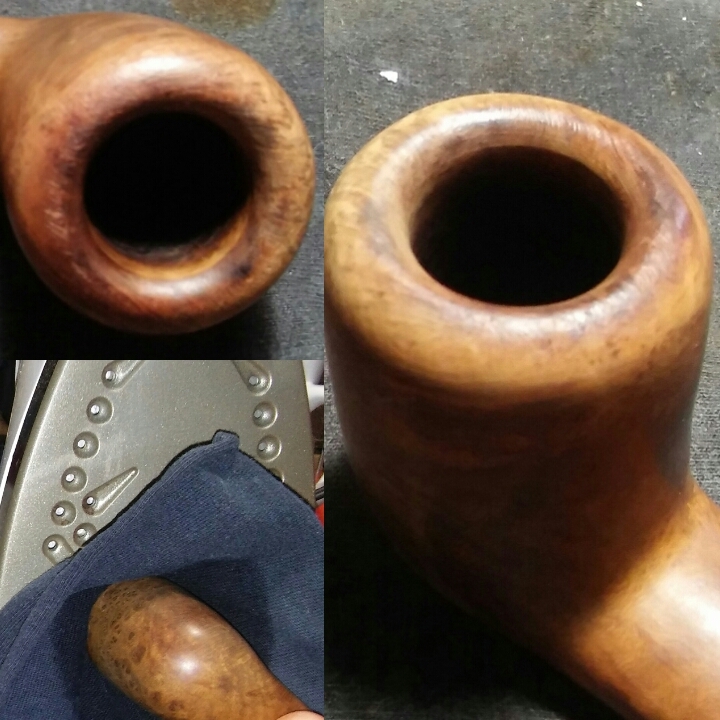 The stain was faded and after sanding the rim and fill areas it left even lighter areas, the stummel would need to be re-stained.I wiped down the stummel with an EverClear dampened rag and let dry. I mixed Fiebing’s leather dye red and dark brown. I applied the stain with a medium paint brush, hitting it with a Bic lighter to set the stain. I removed the excess stain with an alcohol dampened rag and left it to dry. 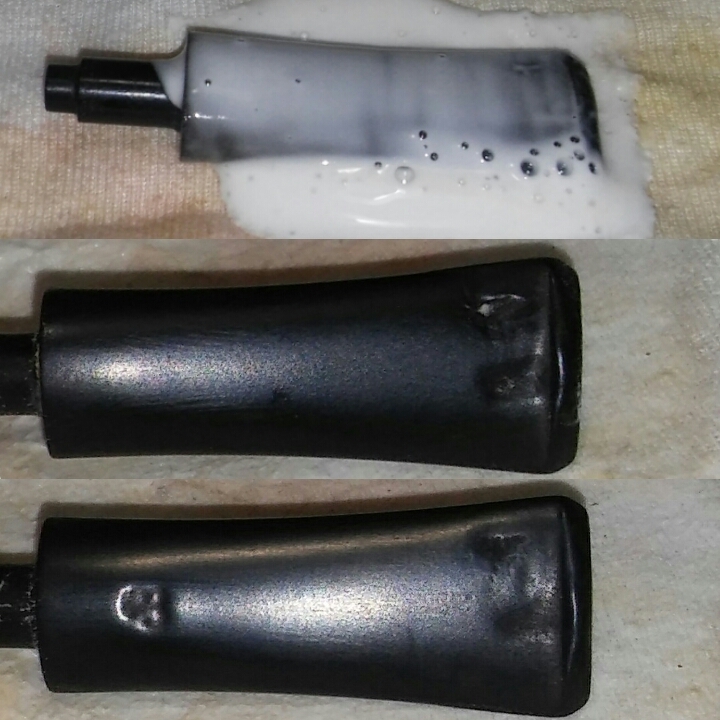 I removed the stem oxidation using non-bleach Soft Scrub and rag. 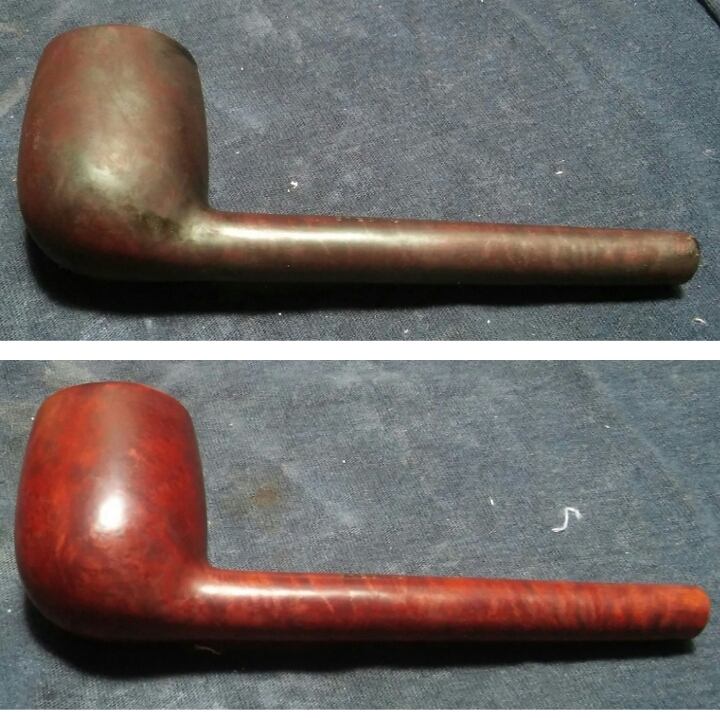 I applied a generous amount of Soft Scrub to the stem and left it to penetrate the oxidation. Once the Soft Scrub turns from white to a brownish color its time to begin scrubbing vigorously with a rag, applying more Soft Scrub as needed. Holding the stem under natural light will help to see if all oxidation was removed. 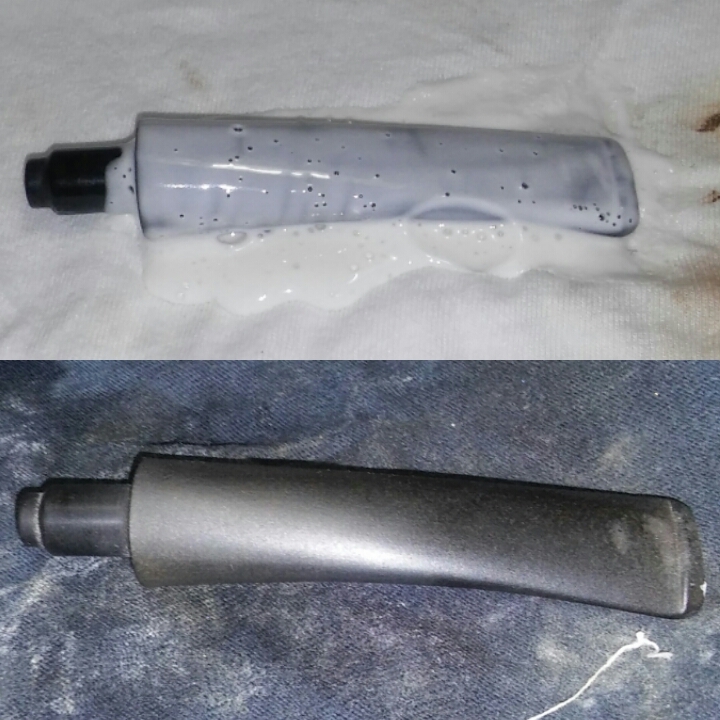 I sanded the area of the deep tooth impressions with 400 grit sandpaper, then wiped down the area with an alcohol dampened rag to remove the dust from sanding. This is were things got interesting, I mixed thick black CA glue and charcoal powder into a paste and applying the paste with a toothpick to the impressions and worn button, as I always do when filling impressions, hitting it with accelerator to set the glue. I left it to cure over night. The next morning after having time to cure I began to shape the new button with needle files and file down the area of the impressions. The patch looked funny as I began removing layers, the patch began to crumble/flake and I started uncovering a ton of bubbles in the patch. So I started over and mixed a new batch of CA glue and charcoal powder. I thought maybe I used the wrong amount of something and it was throwing it off but once again the same bubbles and flaking. 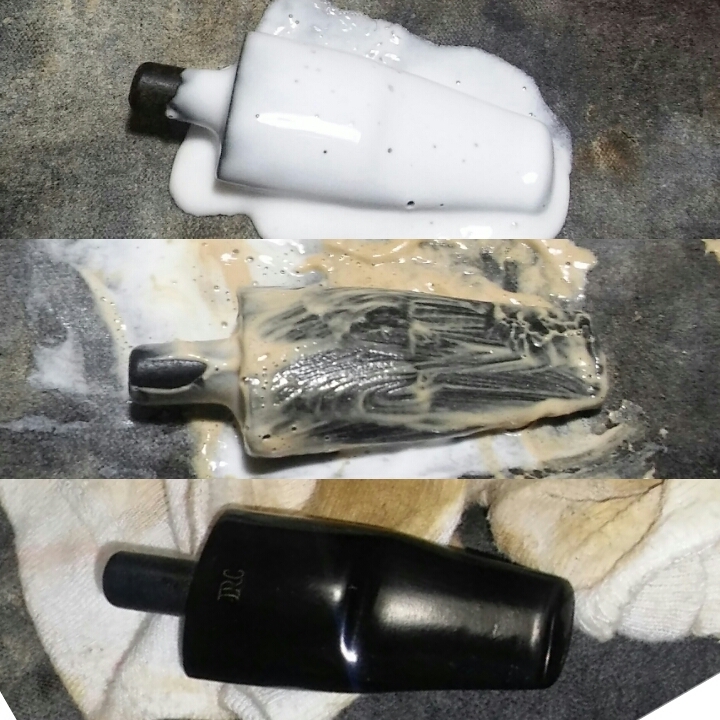 I didn’t take photos but I went over this process a few time before I stopped and took a look at my CA glue, the CA glue had separated leaving a thick mass at the bottom of the bottle and a watery thin liquid on top. In the end I ordered a new bottle of CA and moved on. 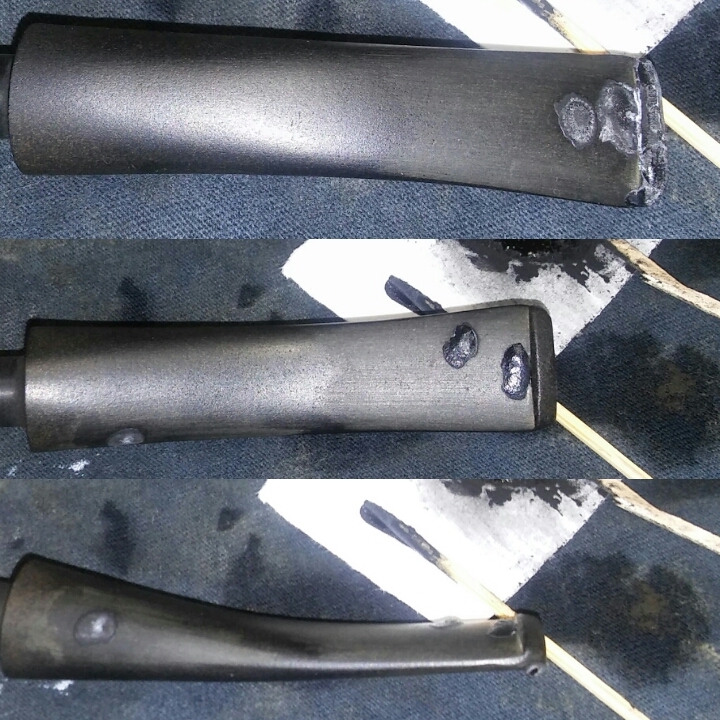 After receiving the new CA glue and sanding the stem completely with sandpaper and the various micro-mesh pads it looked pretty good but there was a slight discoloration at the bit end. 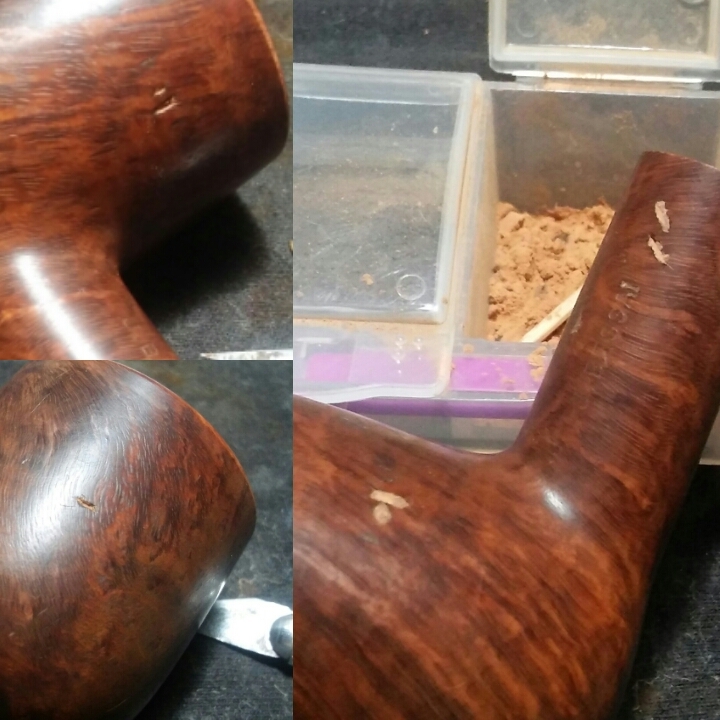 Last thing before hitting the buffer was to add the JB back to the stem, my conventional method would be to apply Rub&Buff and simply wipe the excess away leaving a prefect logo but the logo impression was not deep enough. I used a bristle from my boars hair beard brush as a paint brush. I applied white nail polish to the logo using the bristle and left it to dry, unconventional but it came out nice. Finished up on the wheel with white diamond, a few coats of carnauba and a micro-fiber hand buffing. Buffing the stem with blue compound and carnauba. 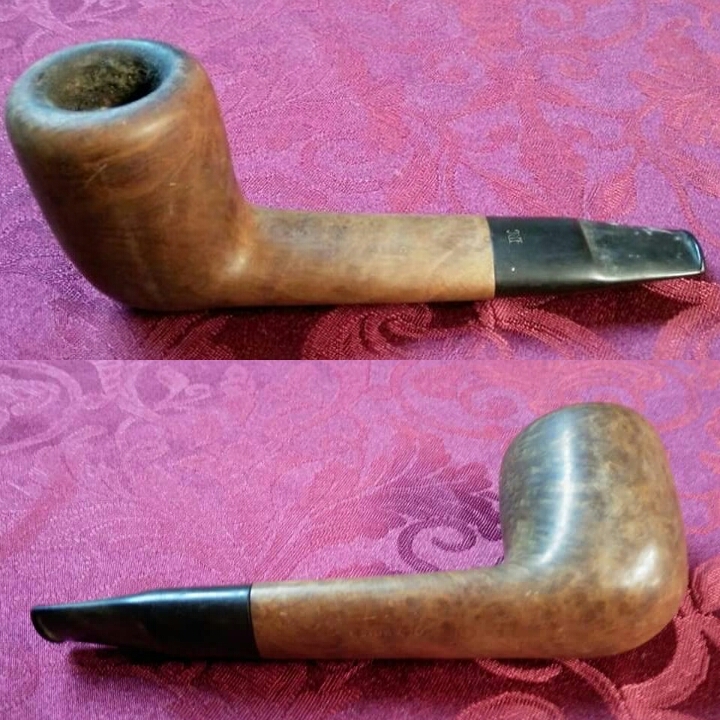 The last of Clint’s trio and my favorite by far, I myself am searching for a similar pipe. Thanks Clint for the incredible Pen & Ink and giving me the opportunity to work on your pipes. I enjoyed seeing them come back to life. Thank For Stopping In And Taking A Look. Way back in February Clint of Pipes Scoundrels sent a huge package out of the blue . We had spoken a month or so before of a pipe that was in need of care but never figured out a plan. In the package a letter where he offered up a trade of sorts skill for skill, I love the barter system. In the package an incredible framed Pen & Ink work, that I watched though his blog come together. I was blown away by his skill and photos online. I had no idea it was coming my way, in person it was even more amazing, beautifully done. Also in the package a couple of Pipe Scoundrels stickers ( he has a killer logo) and three pipes in need of repair/cleaning. A couple John Bessai pipes one Canadian, one Pot and an Iwan Ries a unique shape I’m not familiar with. I was excited to get to work , this was the first time I was to work on someone else’s pipes but I got side tracked and side tracked again but finally I had some time to sit and finish, now the three are complete. 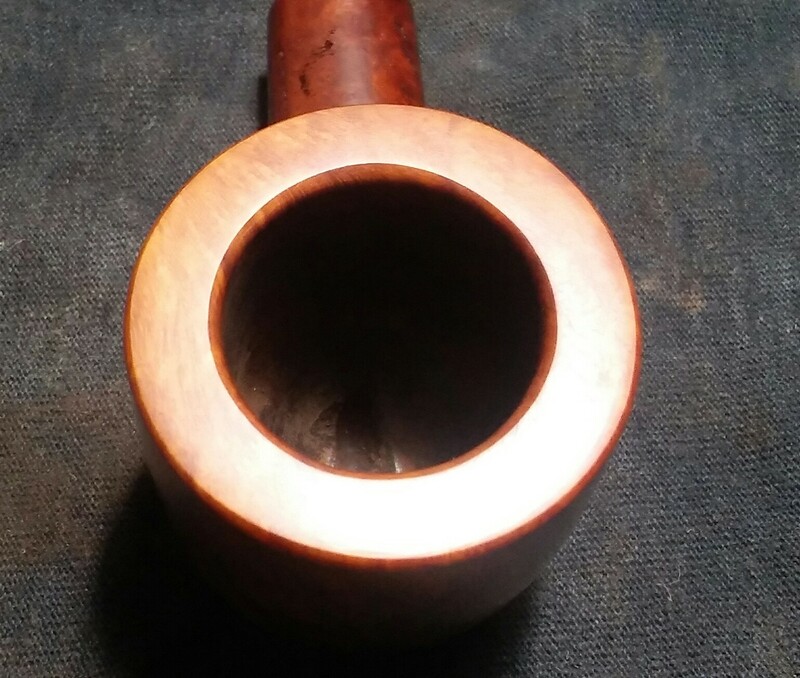 My plain was to write a little something on the history of Bessie pipes but as it has it some else has already done the work and a much better job then I would have. 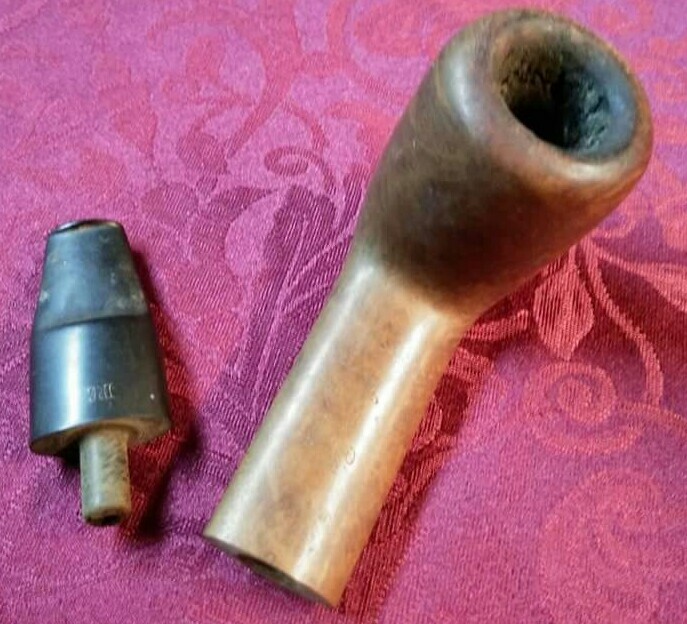 History of John Bessai (thanks to jguss from pipesmagazine forum) Classic Pipe Shops from years gone by in America – pipes and tobaccos and their influence, a well written and informative post. I will say the shop, The John Bessai Pipe Clinic was run between 1909-1993 at 35 Colonial Arcade in Cleveland Ohio. 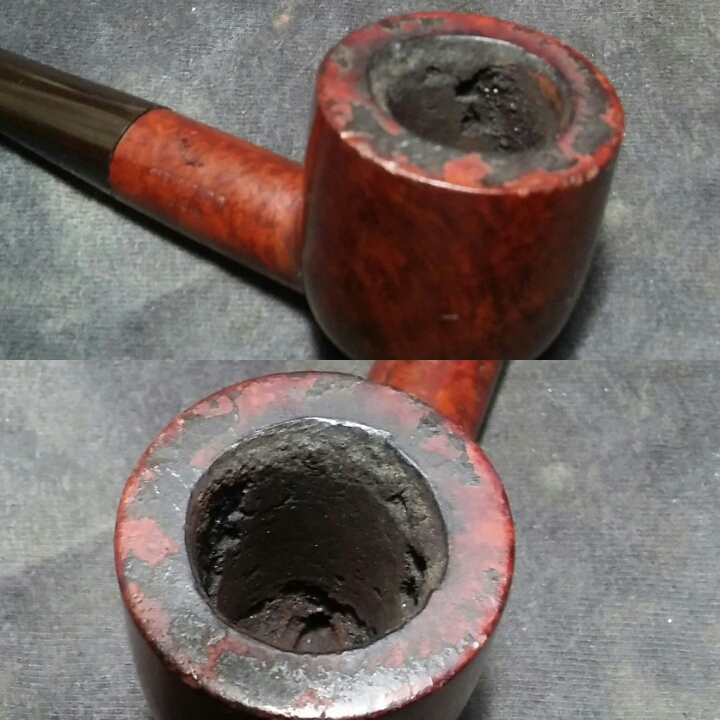 She was in need of help, an ill fitting replacement stem that was oxidized and had a couple of impressions, chunky crumbling cake, a few fills and a rim that was smacked around a bit, but I’m not afraid of a little work. 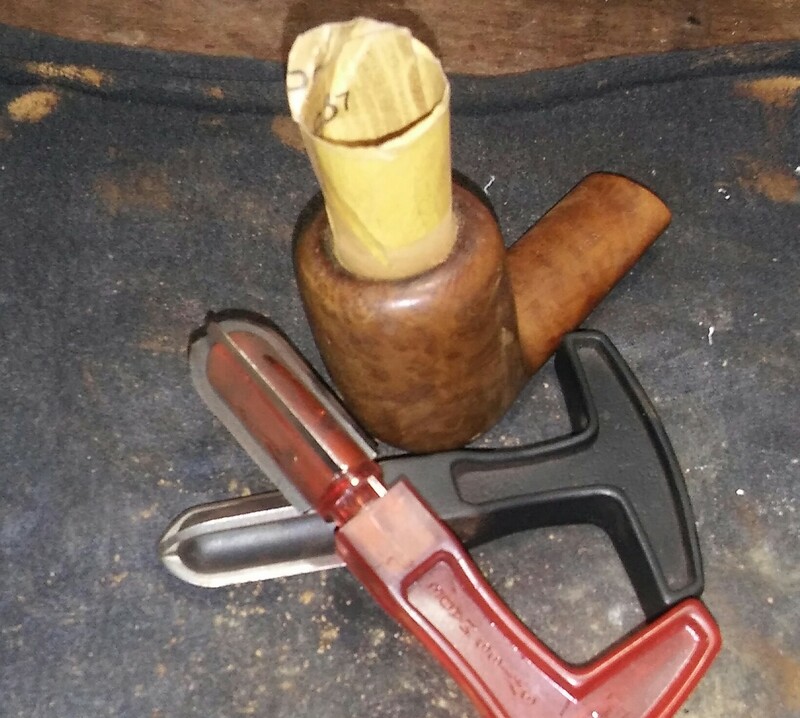 Starting with the stummel and my PipNet reamer I removed the old cake and took the chamber back to briar. The chamber was in descent shape aside from a small burn/defect at the top of the draught hole, I will address this a little further down. I cleaned up the rim with Method Good For Wood Polish and could now see the damaged rim better. 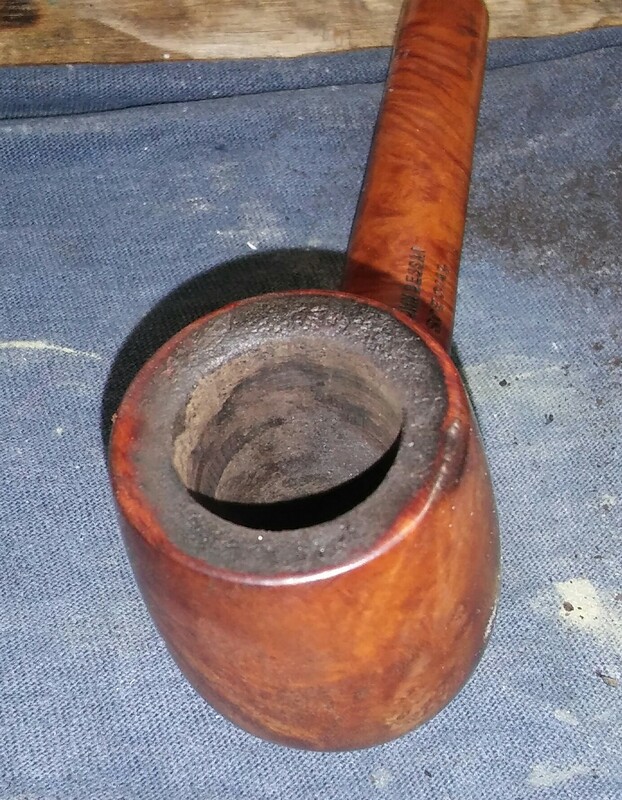 The photo is poor but the top of the chamber/rim was reamed in the past with what I’m guessing was a pocket knife, the edges of the rim were nicked up and missing small chunks of briar. Using needle files and sand paper I began to reshape the rim. First by topping the rim, I taped down 400 grit sand paper and topped the bowl. Next using needle files I reshaped the inner rim removing the file marks with 400 grit sandpaper. I finished the rim with 800 & 1000 grit sandpaper. 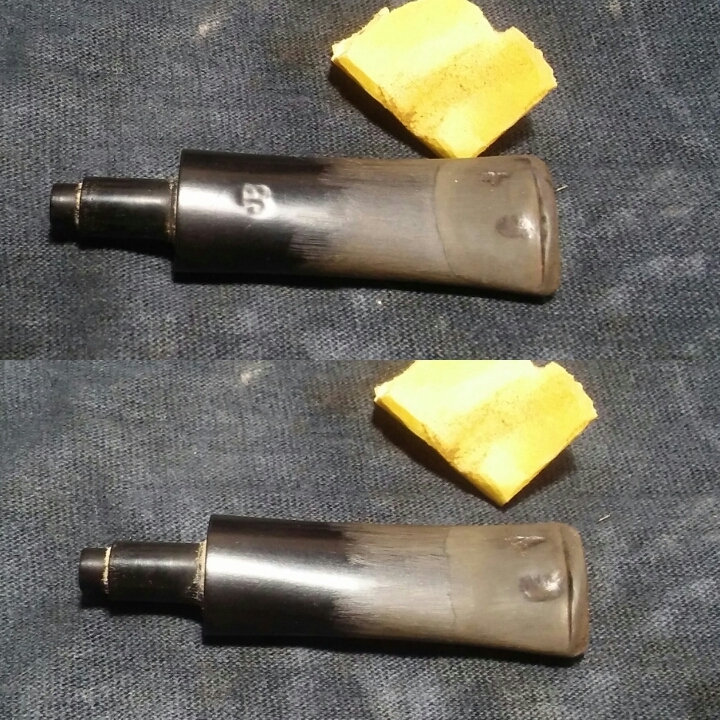 Using EverClear I ran a retort to loosen up the old tars, oils and tobacco. 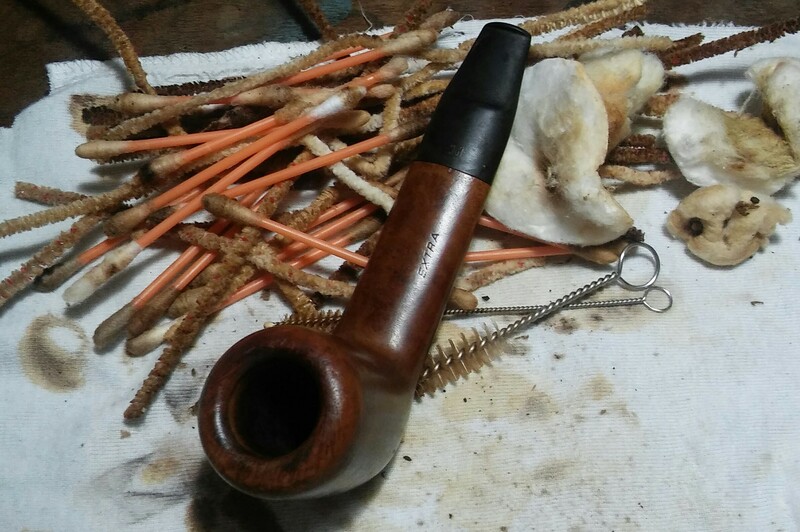 I now gave the stummel and stem internals a good cleaning, using EverClear, shank brushes, mortise brush, Q-Tips, cotton-balls and stiff/soft pipe cleaners. I unrolled cotton-balls, twist them into a swab and turn them tightly into the mortise. I then add EverClear to the chamber and allow the swab to soak up the alcohol, I would repeat this process a few time until the swab comes out clean. I cleaned the stem and draught with stiff/soft pipe cleaners working until my final pipe cleaner comes out as it when in. There were a few dents on the stummel, using a household iron set to medium heat and a damp rag I would steam out the dents. By dampening the rag and covering the dents to be steamed out and placing the stummel to the heated iron, I would repeat this process a few times until I was satisfied all imperfections had risen . There were a few fills that stood out and would have to be removed. Using a X-Acto knife and Method Wood polish, to soften the fill, I removed the old brightly colored filler. I cleaned the area to be refilled with an alcohol dampened Q-Tip. 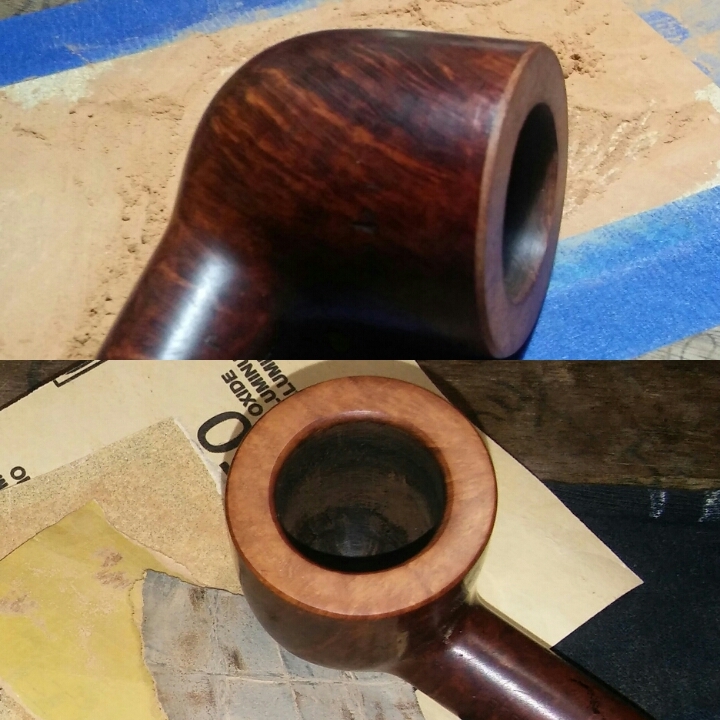 I now filled the pits with briar dust and Gorilla Glue and allowed it to dry. Once the new fill had time to dry I sanded the areas first with 800 grit sandpaper and finishing with 1000 grit sandpaper. Now the stem, I applied a generous amount of non-bleach Soft Scrub, leaving it aside to allow the Soft Scrub to penetrate the oxidation. Once the Soft Scrub turns form white to a brownish color its time to scrub vigorously with a rag, scrubbing until all the oxidation has been removed. Holding the stem in natural light will allow you to see if all the oxidation was removed. Now the ill fitting replacement stem, the tenon fit snug but the stem and shank had a poor fit, the stem was a bit larger then the shank. 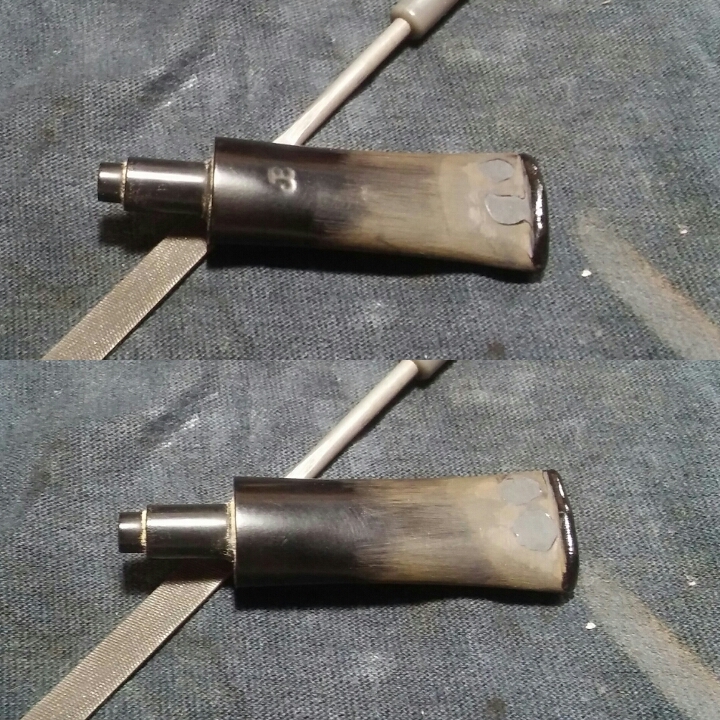 Starting with 220 grit sandpaper I sanded down the stem until a uniform fit between shank and stem was achieved.At this time I removed any tooth impressions and sanded the entire stem and the end of the shank with 400 grit sandpaper. 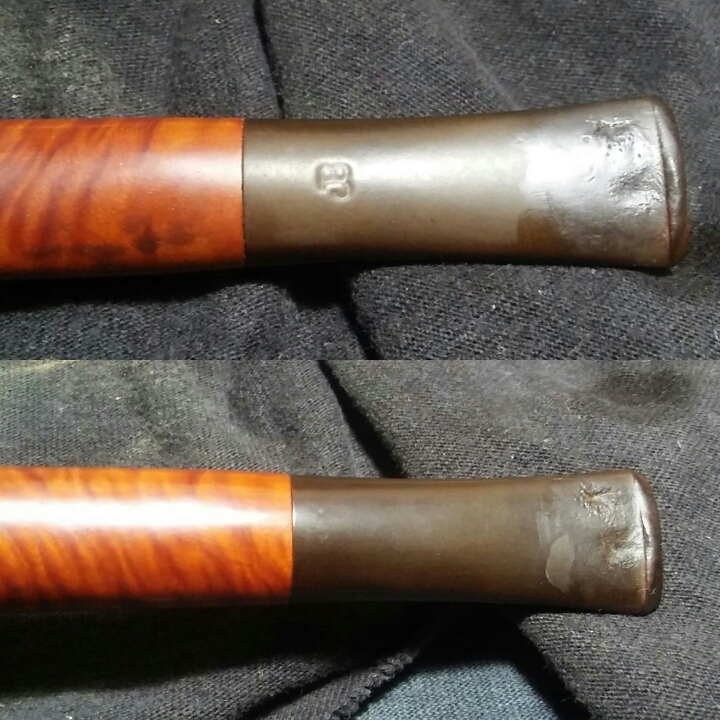 I went back in with a brown touch up stain marker and re-stained the shank and fill areas. At this time I took care of the missing chunk at the top of the draught, mixing ash with a little water to make pipe mud I filled the missing spot with the mud and allowed it to harden. I checked before sending it off to Clint and the repair was solid. The button had an odd indentation and was worn down. 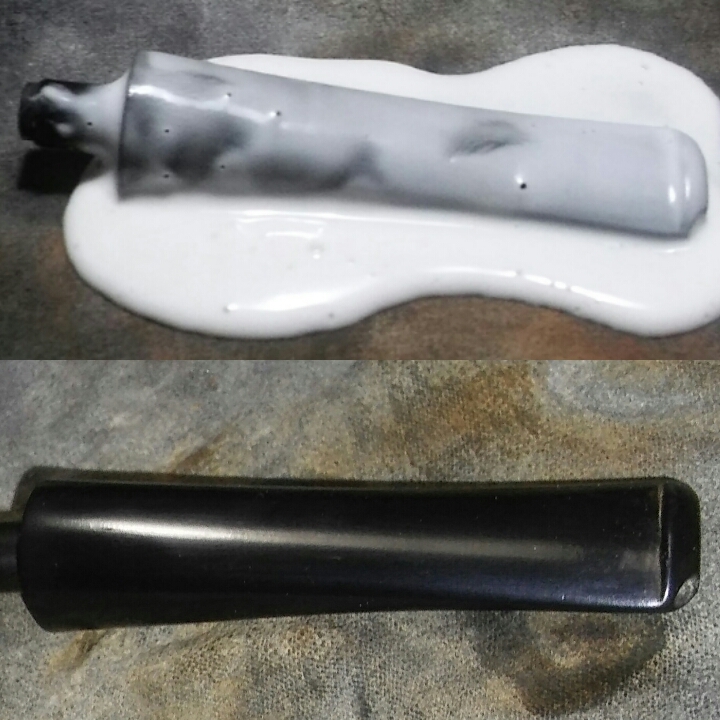 I mixed thick black CA glue and charcoal powder together to make a paste, using a toothpick I applied the paste to the button hitting it with accelerator to set the glue. Using needle files and sandpaper I began to shape a new button. Now I ran the stem thought the various girts of sandpaper and micro-mesh. Starting with 800 grit sandpaper wet, 1000 grit paper wet, 1500 grit paper wet, 1500 micro-mesh wet, 1800 mesh wet, 2000 grit sandpaper wet, 2400 mesh wet. Then the remaining micro-mesh pads dry 3200-12000. I finished up on the wheel with white diamond, a few coats of carnauba and a micro-fiber hand buffing. Buffing the stem with blue compound and a few coats of carnauba. Thanks again Clint the pipes were a pleasure to work on, a nice change from my Custombilt craze . Way back in February Clint of Pipes Scoundrels sent a huge package out of the blue . We had spoken a month or so before of a pipe that was in need of care but never figured out a plan. In the package a letter where he offered up a trade of sorts skill for skill, I love the barter system. In the package an incredible framed Pen & Ink work, that I watched though his blog come together. I was blown away by his skill and photos online. I had no idea it was coming my way, in person it was even more amazing, beautifully done. Also in the package a couple Pipe Scoundrels stickers ( he has a killer logo) and three pipes in need of repair/cleaning. A couple John Bessai pipes one Canadian, one Pot and an Iwan Ries a unique shape I’m not familiar with. 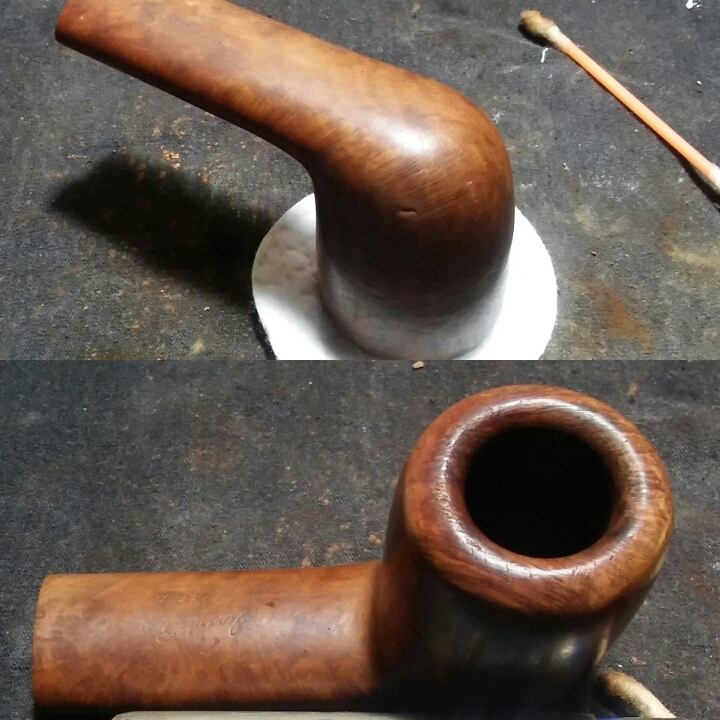 I was excited to get to work , this was the first time I was to work on someone else’s pipes but I got side tracked and side tracked again but finally I had some time to sit and finish. Now the three are complete. 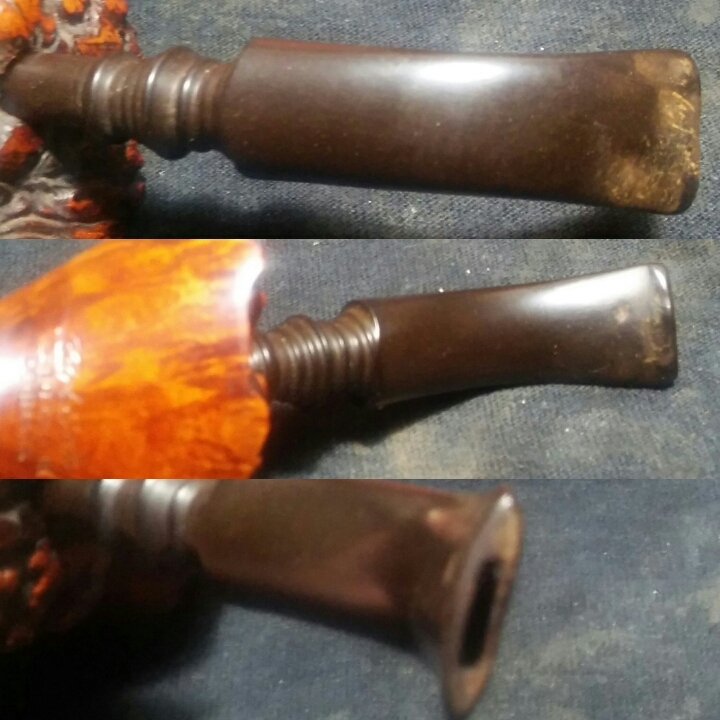 The first three photos were sent by Clint, this was the original pipe that we had talked about a few months back it was in need of a good cleaning. The shape was interesting and not one I’ve seen before. The name however I was familiar with, Iwan Rise & Co an establishment I would like to visit before I kick the bucket. There pipes were made by different manufacturer’s over the years. Overall the pipe was in good condition. 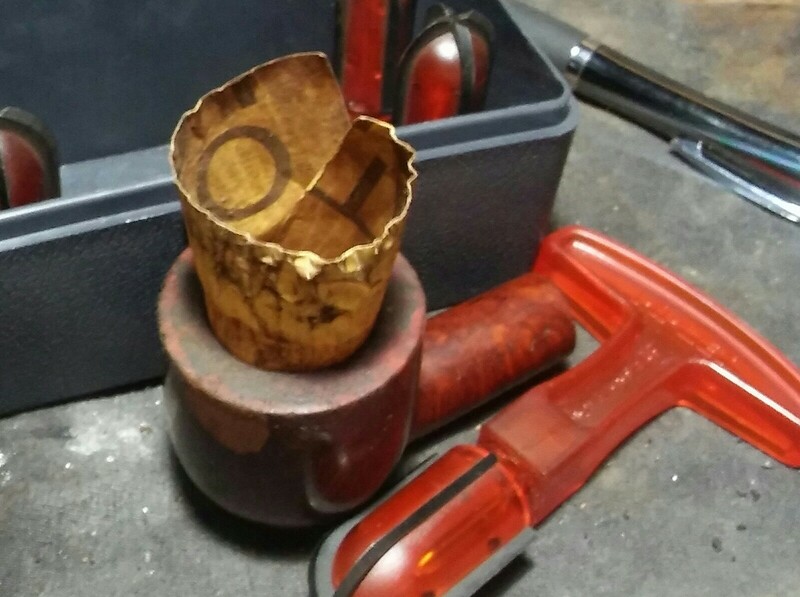 The stain had long worn to a lighter color, the chamber had a thick & crumbling cake, the stem was oxidized with mild tooth impressions and the rim had a few indentations. The narrow chamber would need a tag team of young and old to tackle. My old Castleford reamer attachments ran a little smaller than the Pipnet set. Starting with the smallest attachment from my Castleford set I slowly worked my way to the bottom of the chamber, then working between the Pipnet set and Castleford set I reamed back the old cake. Finishing up with 400 grit sandpaper to smooth out the chamber. Next I addressed the rim, for the most part it was free of any heavy tars, oils or charing. 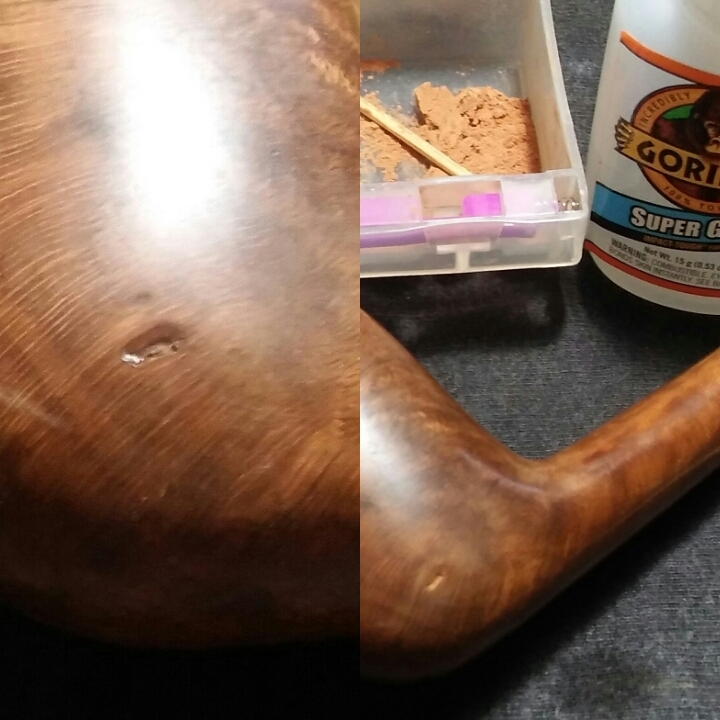 I applied a light coat of Method Wood For Good Polish to the rim and left it upside down on a make-up pad so the polish could soft up the residue. After allowing the stummel time to sit, the tars and oils were removed with a Q-Tip. With the rim clean I could now work on the rim indentations. Using a household iron set to medium heat and damp rag I steamed the indentations out. After the steam there were still a few spots in the inner portion of the rim that needed attention. I worked through a variety of sandpaper, starting with 800, 1000, 1500 and 2000 until all traces of the dents were gone. I now moved on to the internals of the stem and stummel. 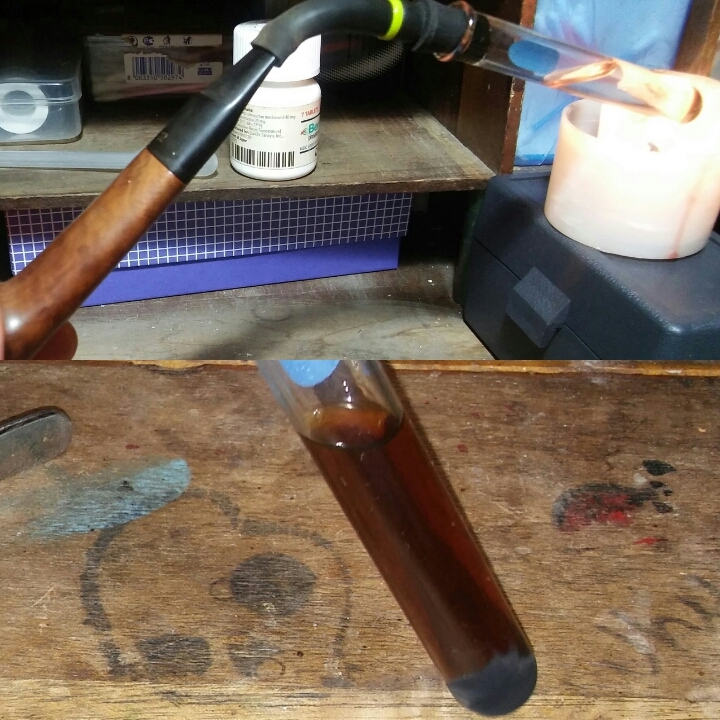 Using EverClear and a cotton ball lightly inserted in the chamber I ran a retort to loosen the old tars, oils and tobacco. 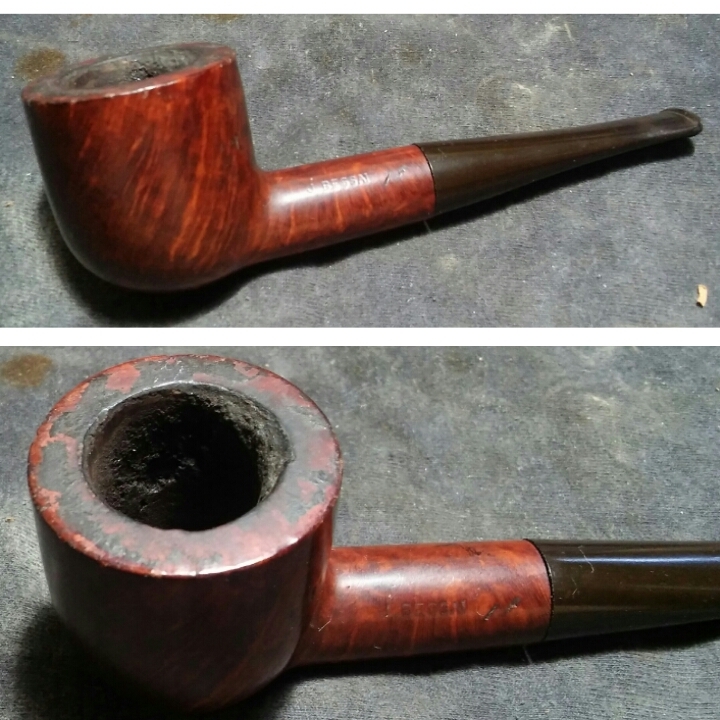 After the retort I did a vigorous cleaning of the stem and stummel internals. Using EverClear, a shank brush, mortise brush, Q-Tips, make-up pads and stiff/soft pipe cleaners. I worked the internals until my final pipe cleaner came out as it went in. The stummel had one noticeable fill that the filler had crumbled away. Using Gorilla Glue and briar dust I filled the pit, after allowing the fill to dry I sanded the area with 800, 1000 and 1500 sandpaper. 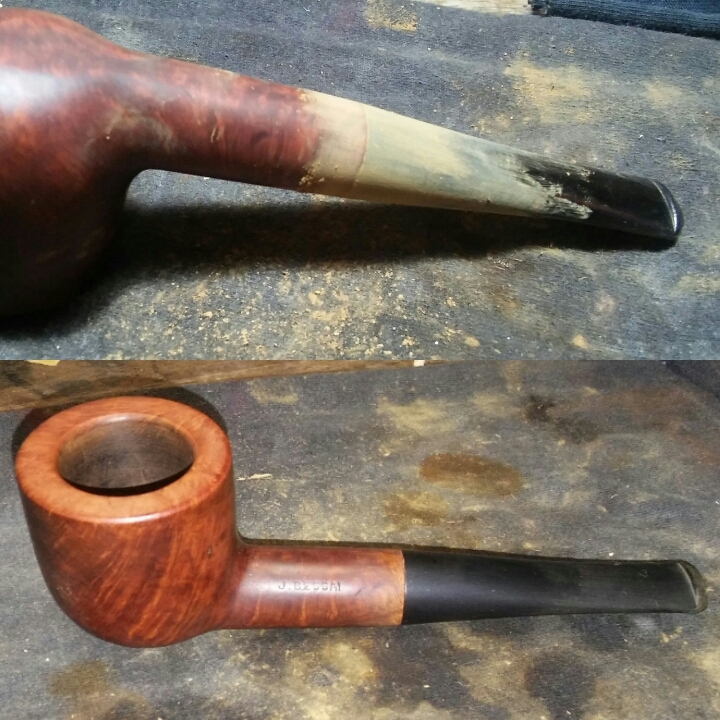 Now the oxidized stem, I applied a generous amount of non-bleach Soft Scrub to the stem and left aside until the Soft Scrub penetrated the oxidation. 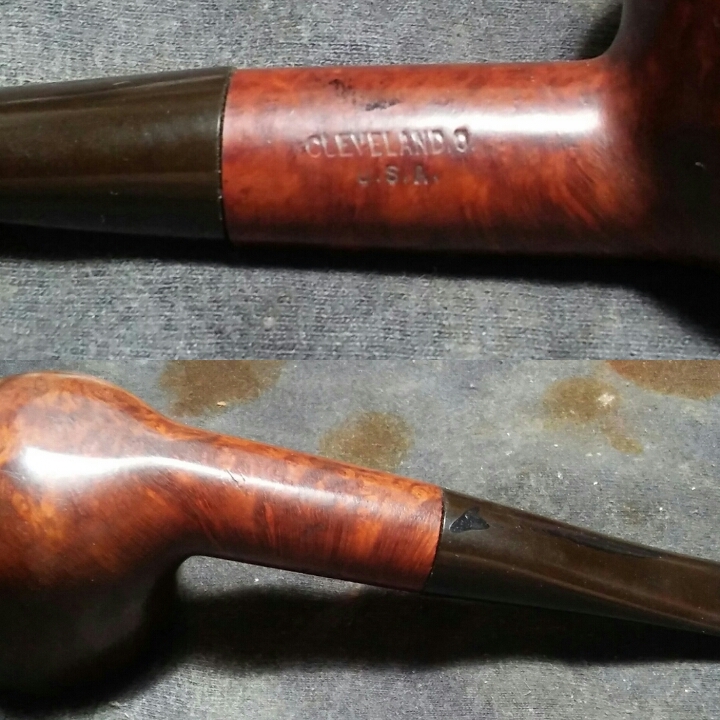 Once the Soft Scrub turns from white to a brownish shade it’s time to scrub the stem vigorously with a rag until all noticeable oxidation is removed. Holding the stem under natural light will allow you to see if all oxidation has been removed. 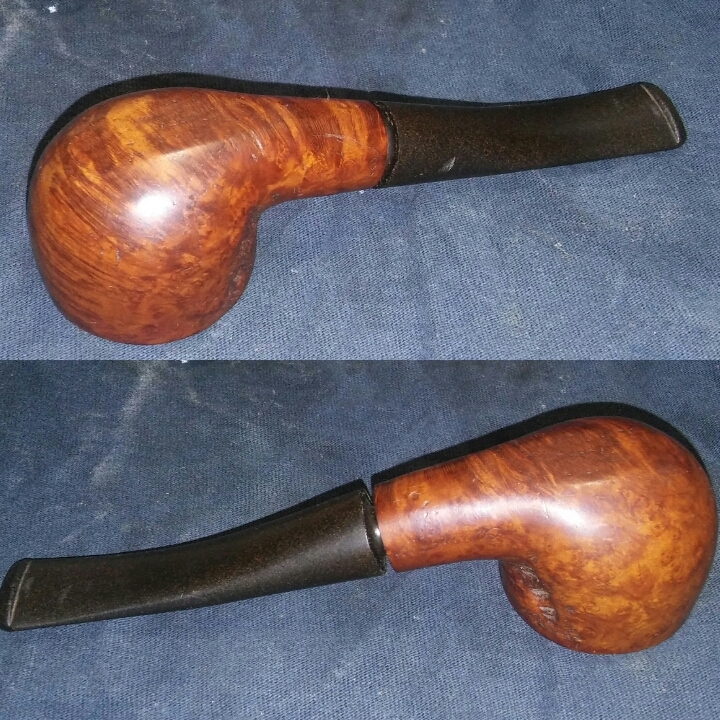 The Soft Scrub had removed the oxidation and the stem was in good shape aside from light chatter at the bit/button area. I taped off the bit portion of the stem with blue painters tape so my sanding would remain in the area that needed attention. I started with 800 grit sandpaper wet, then 1000 grit paper wet, 1500 grit paper wet, then on to the various grits of micro-mesh -1500 mesh wet, 1800 mesh wet, 2000 grit sandpaper wet, 2400 mesh wet, 3200 mesh dry through 12000 dry. I removed the painters tape before polishing the stem with final two micro-mesh pads 8000 & 12000. The final step before hitting the buffer was to tighten the loose-fitting tenon. 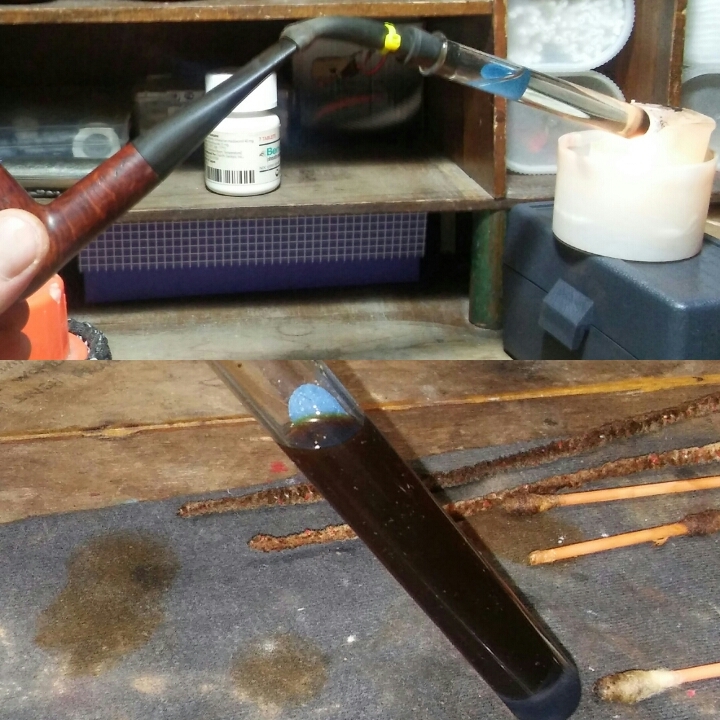 I run into this more times than not after cleaning an estate pipe. 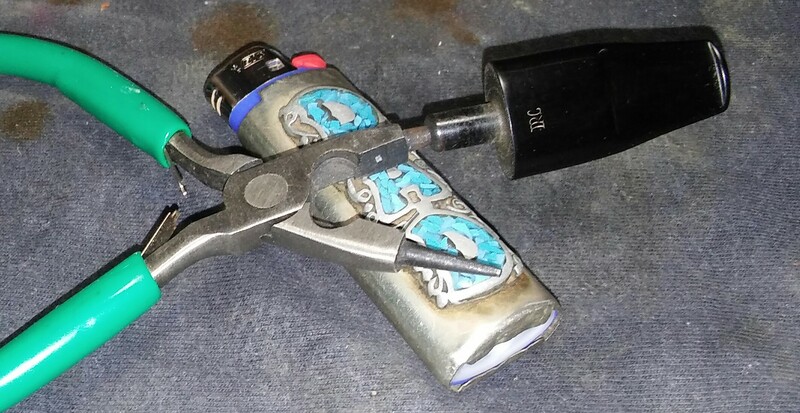 I expanded the tenon by lightly heating the tenon with a Bic lighter and slowly inserting the end of a round tip pair of jewelry pliers. Repeating until a snug fit between tenon and mortise is achieved. 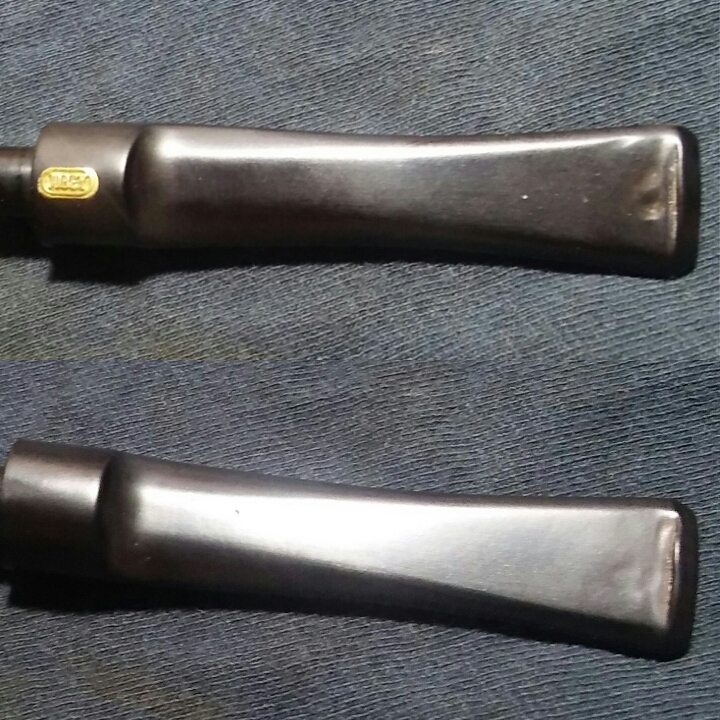 When using this method to expand the tenon take care not to over or under heat, over heating causes melting, burning or a misaligned tenon , under heating will cause a cracked tenon. Finished up on the wheel with white diamond, a few coats of carnauba and micro- fiber hand buffing. Buffing the stem with blue compound and carnauba. Thanks again Clint I thoroughly enjoyed restoring these estates. I still think I got the better side of the deal. Thanks for taking a look, I hope you enjoyed reading as much as I enjoyed restoring.